Here is the existing toerail. 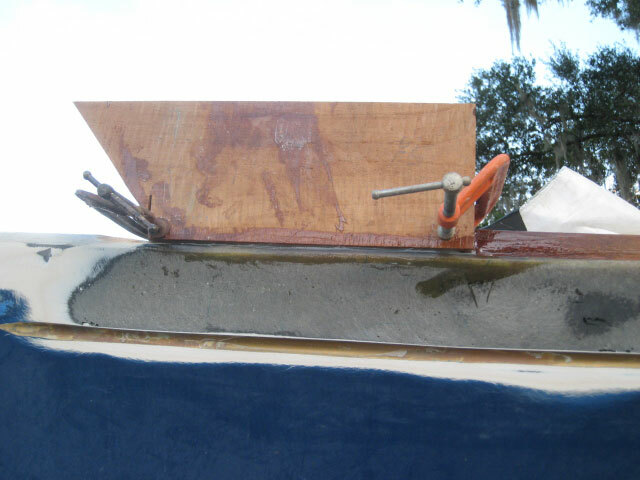 Here I have ground thru the gelcoat down to the fiberglass on the hull flange. Here I have begun grinding the deck side of the torail. Here is a shot of the topsides with the gelcoat removed by my Festool. 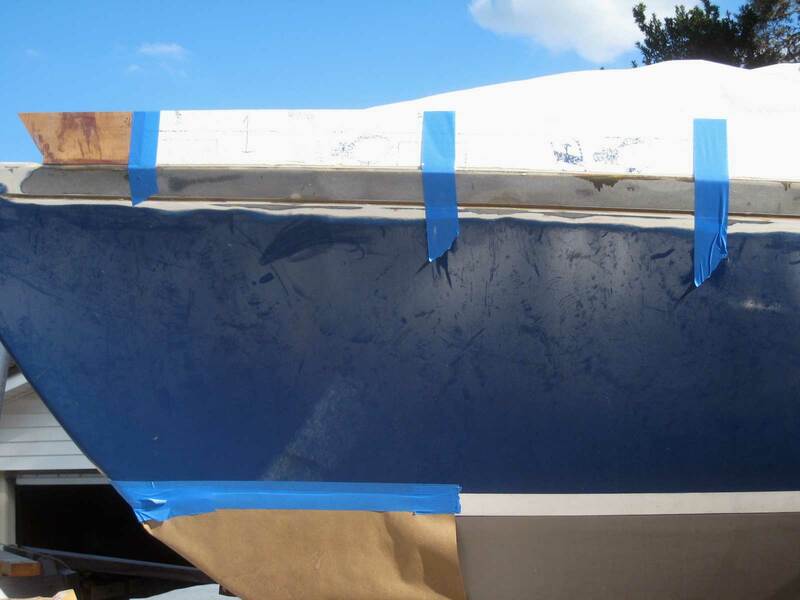 You have to get all the gelcoat off if you want the bond of new fiberglass to be strong. I also take the Awlgrip off below the cove stripe since I plan to fill the cover stripe with epoxy. 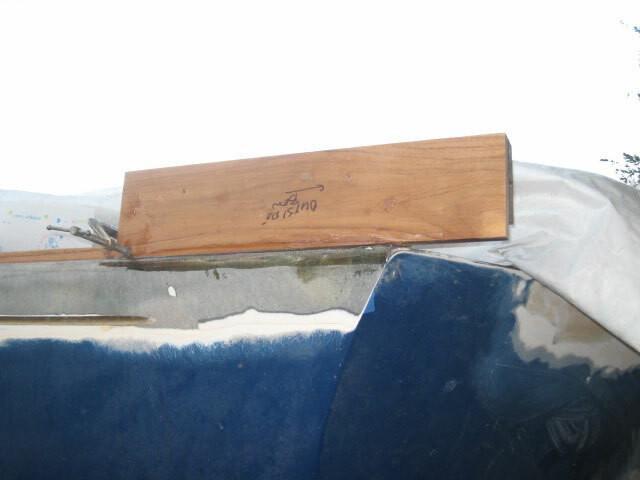 One of the issues I have had with my Bristol for a long time is that of cracks along the turn of the hull like these in the photo. 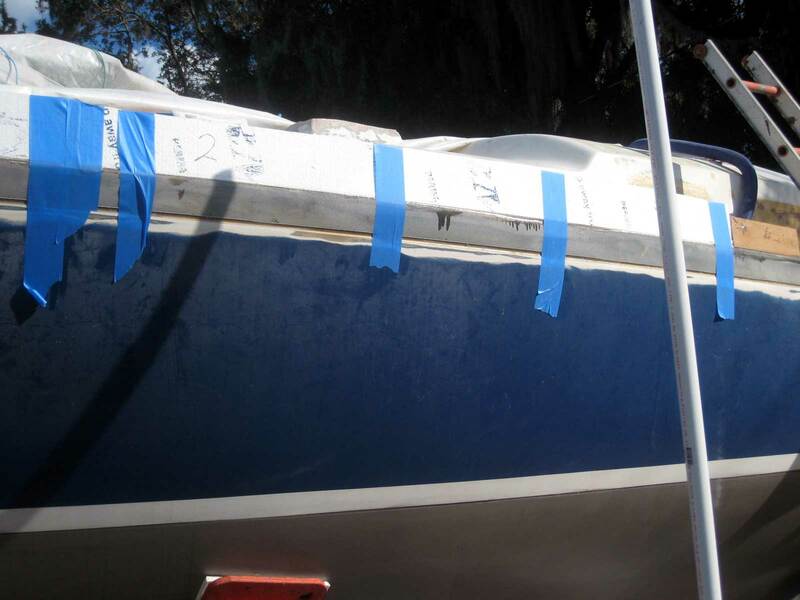 I don't know if other Bristol owners have similar problems--I sail my boat very hard which I think contributes to the cracks. 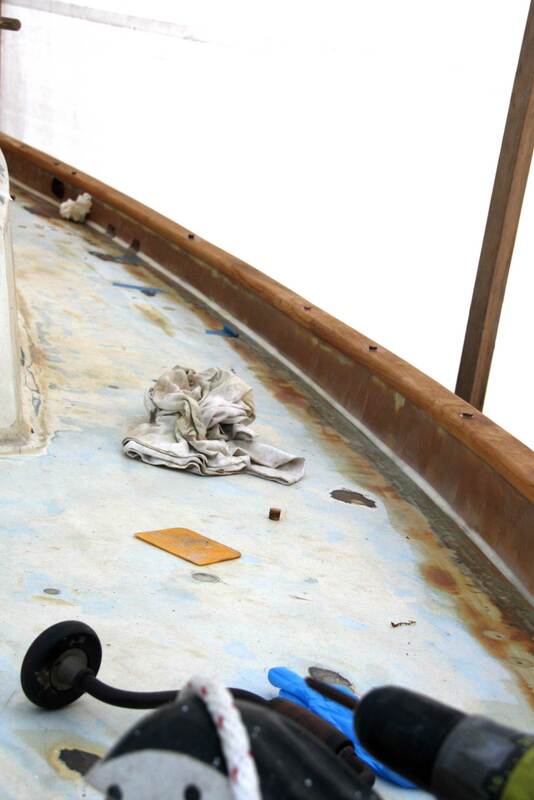 In the past I have tried filling them when I had the boat repainted, but they reappeared. It is only the gelcoat cracking. I think the yard, at least for my boat, made the flange joint extra thick with gelcoat and it simply tends to crack there. 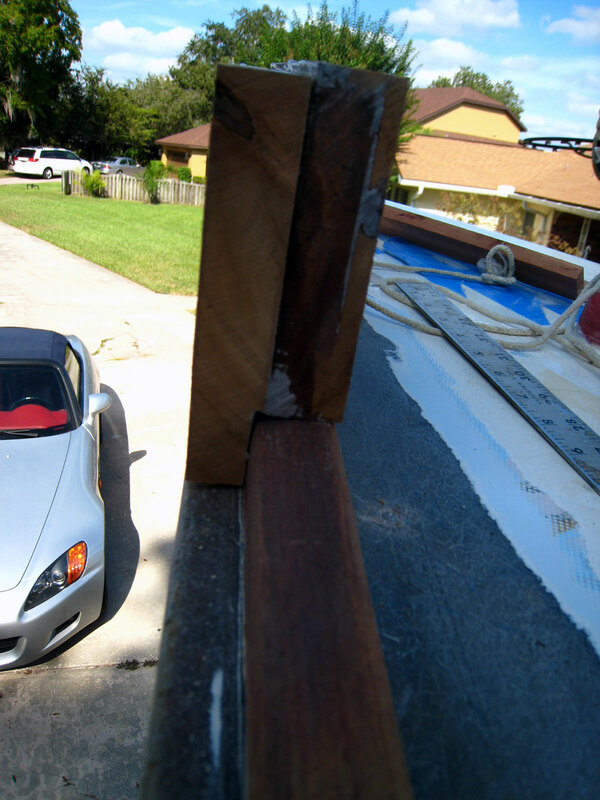 The cracks do not extend into the fiberglass. Here is the topsides finished. 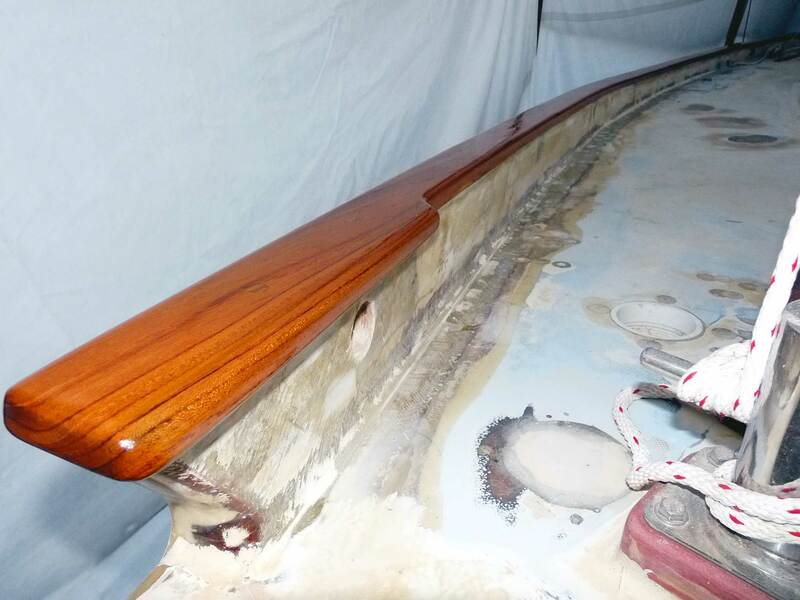 Here is the deck edge tapered for fiberglassing and I have fresh sanded the teak toerail. 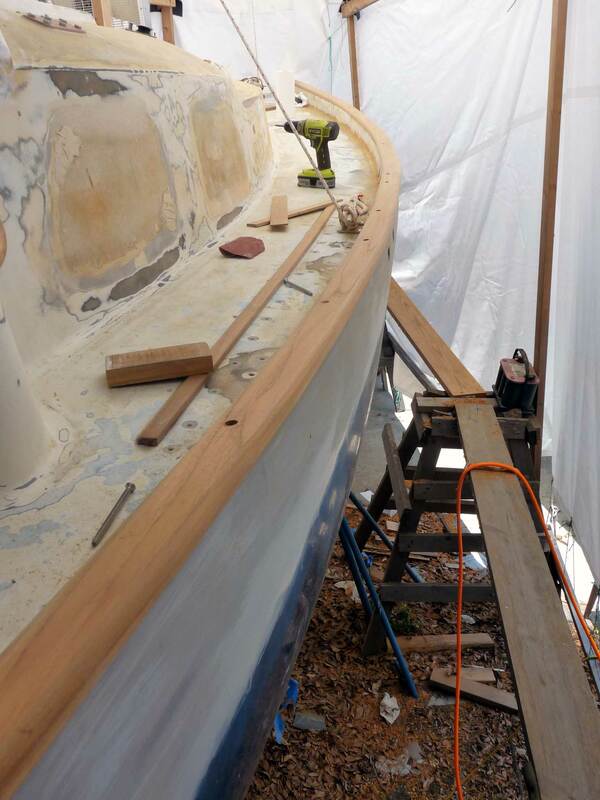 At this point I will begin cutting the teak hawse pipe braces, forward, amidships and aft. Fit them, clue them in place and thru bolt them. 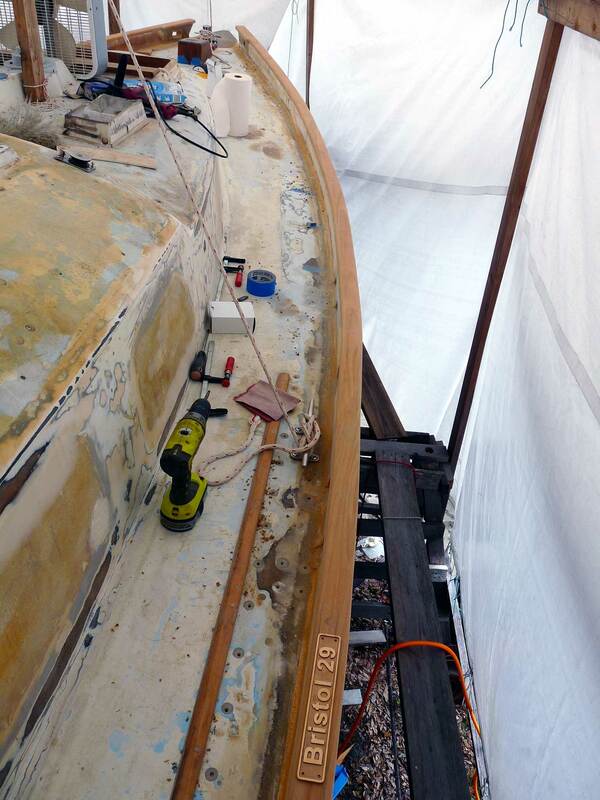 Next, I began fashioning the forward, amidships and stern hawse pipe braces out of teak. 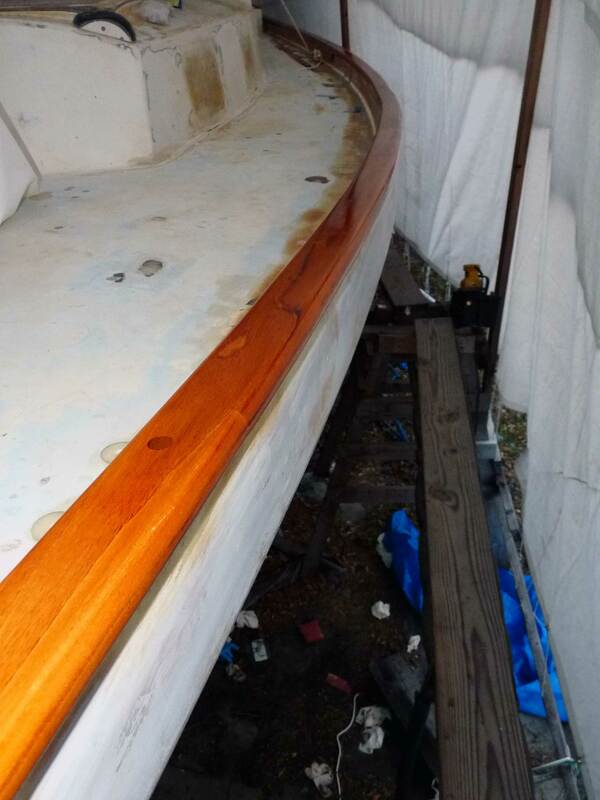 As with the starboard side I glued two plants together to get the thickness I needed: the inside plank an inch shorter to account for the toerail. Here are some shots. Here is the bow hawse pipe brace. 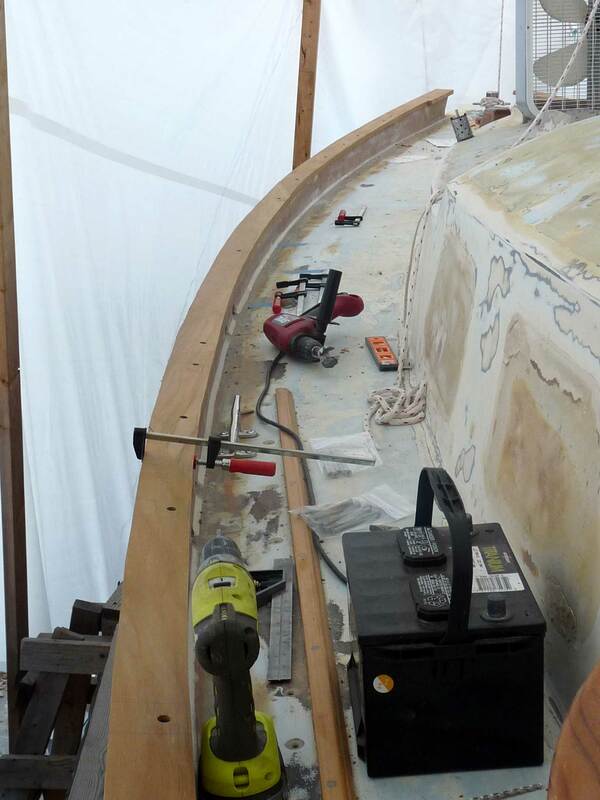 Checking the vertical angle of the bow brace to match the starboard side. I decided to try West System's Six-Ten epoxy. 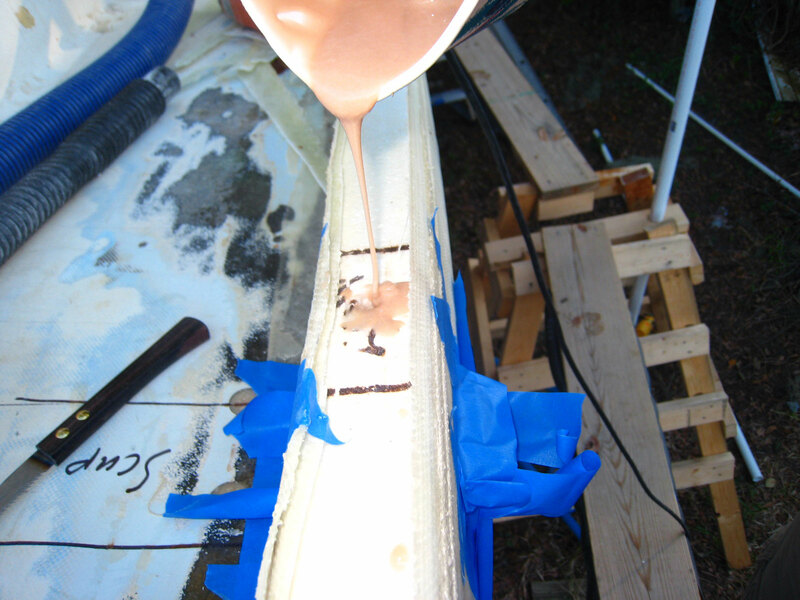 It comes loaded in a caulking tube and mixes as you pump the caulking gun. It is said to be more water resistant and more flexible than the original epoxy. Frankly I could not be more happy with the original stuff but it's nice to not have to load up caulking tubes. 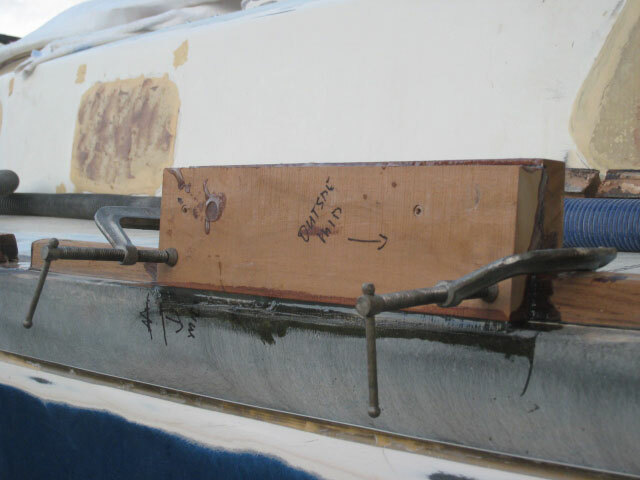 Here is the amidships hawse pipe brace glued and clamped. And here is the stern hawse pipe brace. Notice it extends past the stern a good 5 inches. 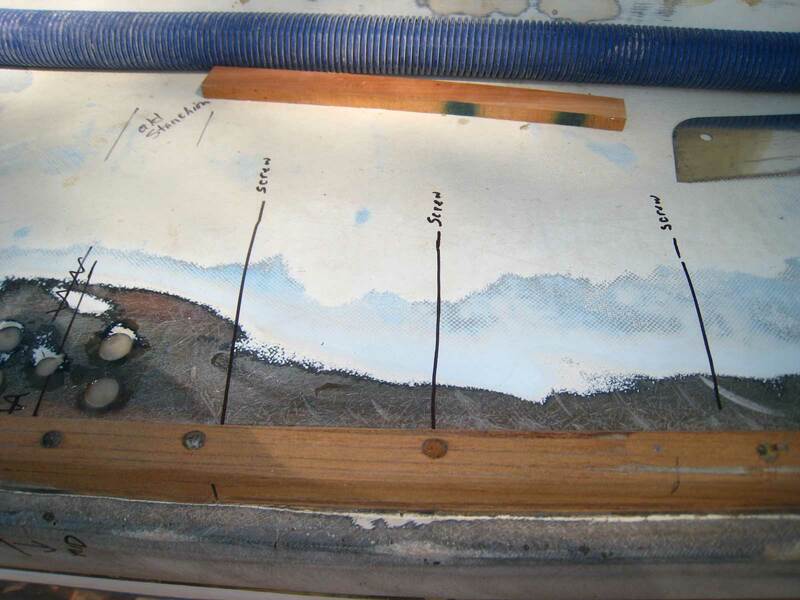 That will give me enough material to cut the angle of the transom into the aft facing edge of the brace. Then as the Six-Ten began to kick, I measured for the scuppers on either side of the amidships hawse pipe. The scuppers are each 3 inches wide, separated by 4-1/4 inches and are 9-1/4 inches fore and aft of the brace. 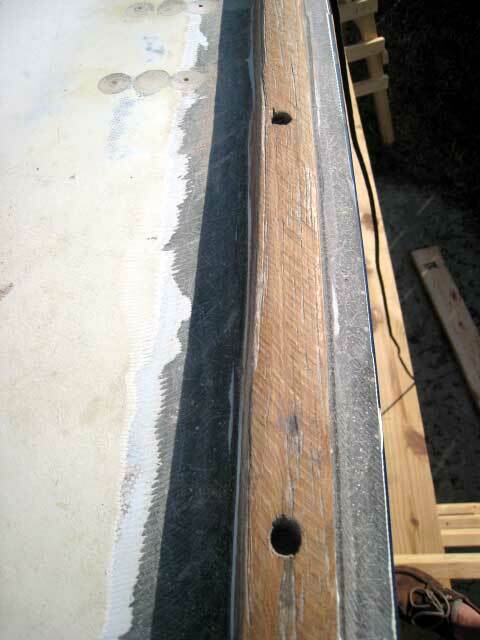 I found several hull to deck flat head screws which all were tightened an addition quarter turn. 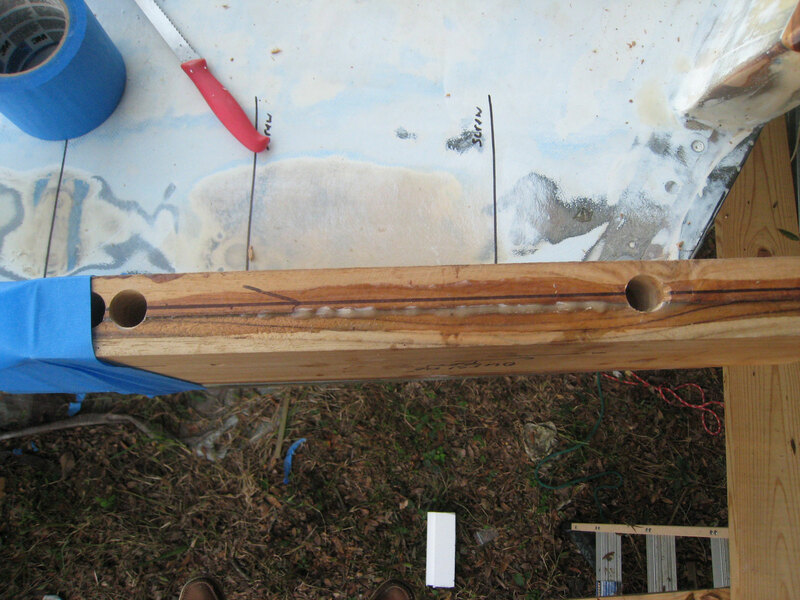 I dug out the mastic that seals the hull to deck joint and cleaned everything up with acetone. 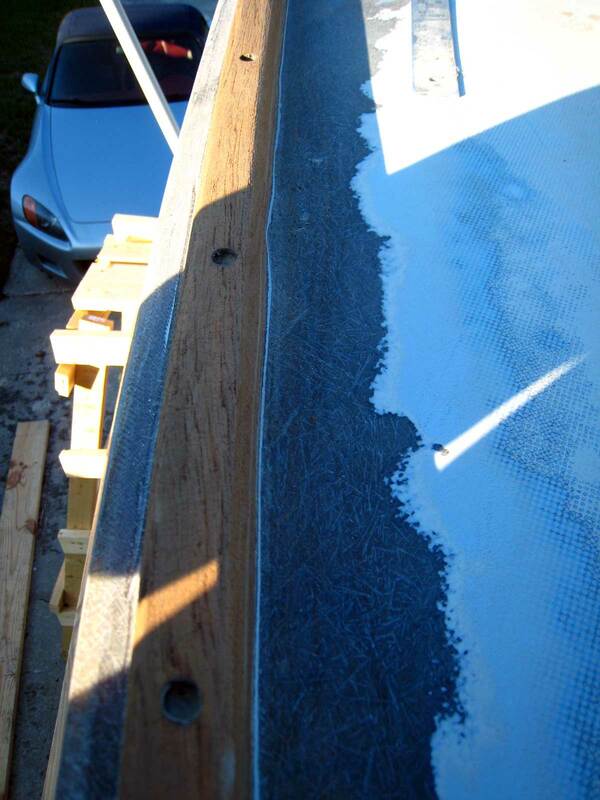 Then I spooned a loose mix of epoxy and 404 high density filler into the gap that the mastic filled. I will sand everything when the epoxy hardens. 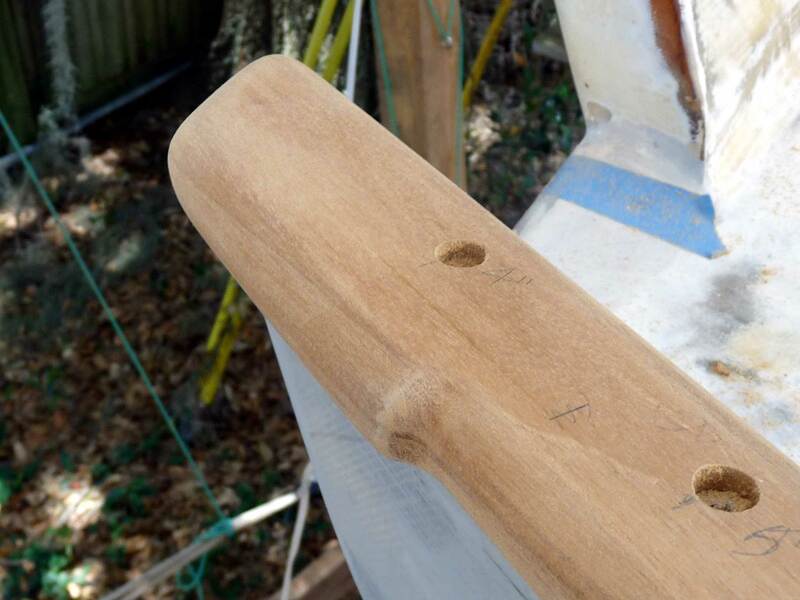 The next step is to cut the foam bulwarks that will fit between the teak hawse pipe braces. 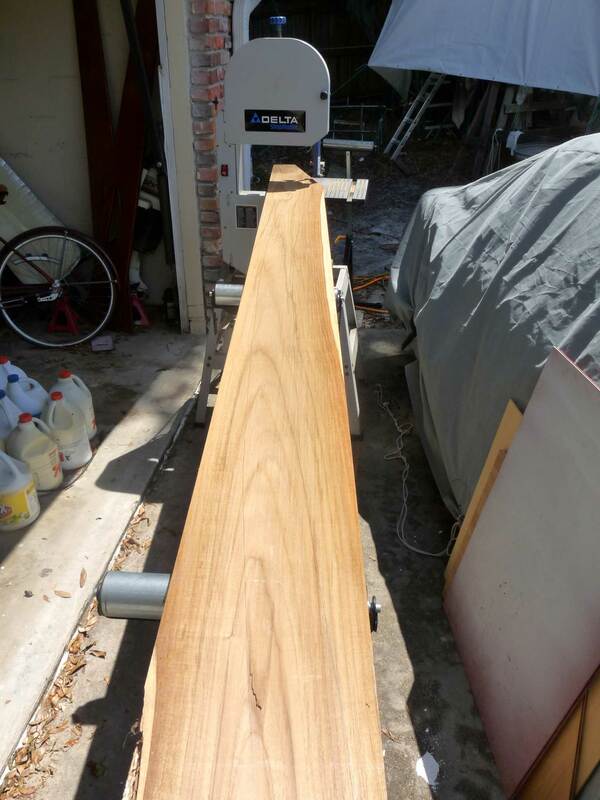 I used my table saw to cut 4 pieces each 8' long, and notched for the toerail. I pealed the plastic protection sheets off both sides--gluing to the sheets would do no good at all. 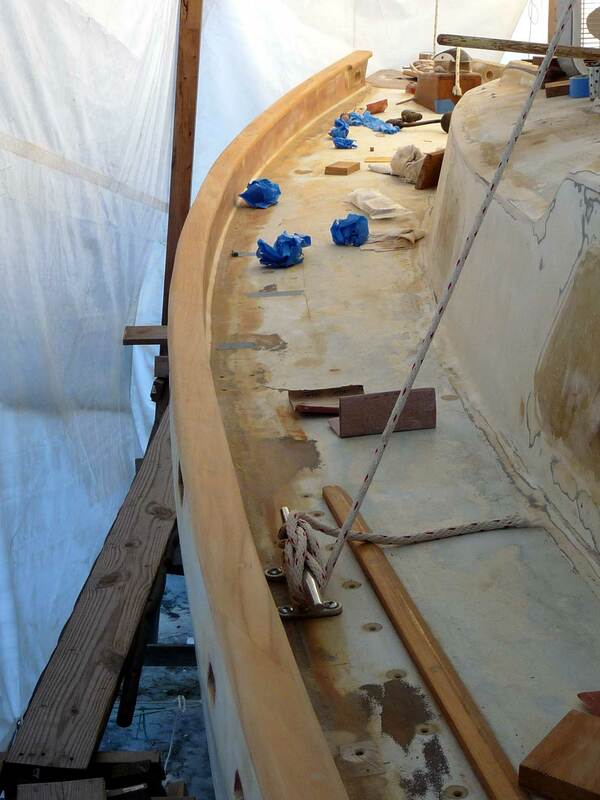 Then I wet out the top and outside edge of the teak toerail, and to top edge of the hull to deck joint. I used the West Six-10 epoxy to run beads of glue down the rabbit I cut for the toerail, and over the toerail. 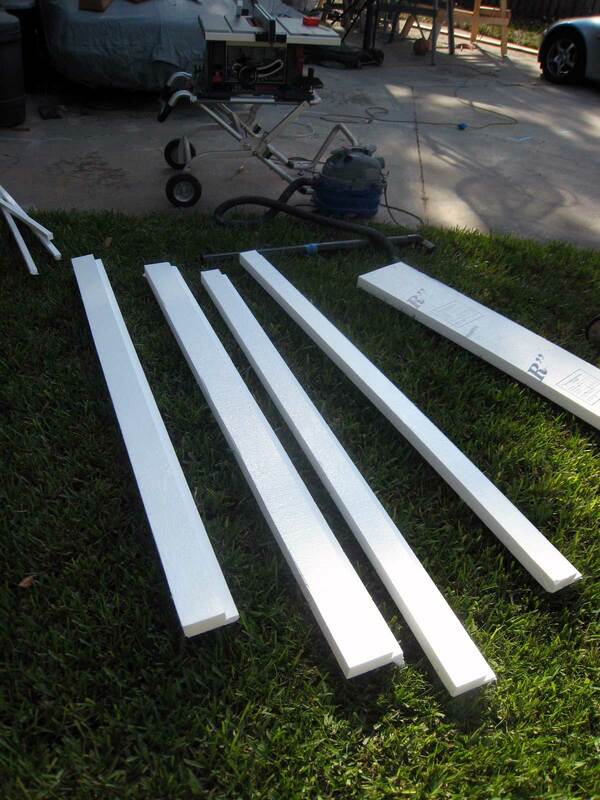 When everything was ready I pressed the foam boards down onto the toerail and taped it place. Next, I drilled holes into the three teak hawse pipe braces to thru-bolt them with 5/16" 316 stainless carriage bolts. I won't bolt them down until after the epoxy has hardened for about a week or more. 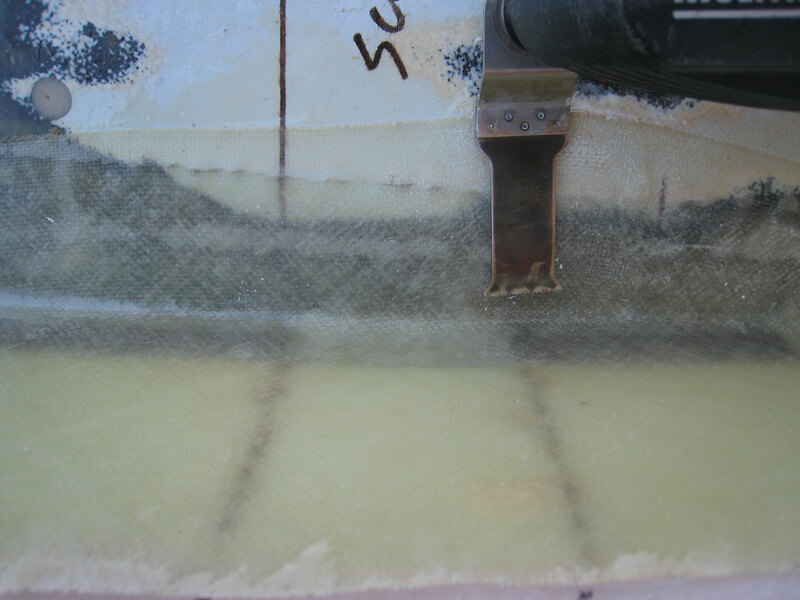 Finally, I ran a fillet if the Six-10 epoxy along the inside of the toerail, and used some thickened epoxy to fair the outside of the joint between the topsides and the foam. I would have liked to glass in the foam today but rain threatened so I will do that next weekend. 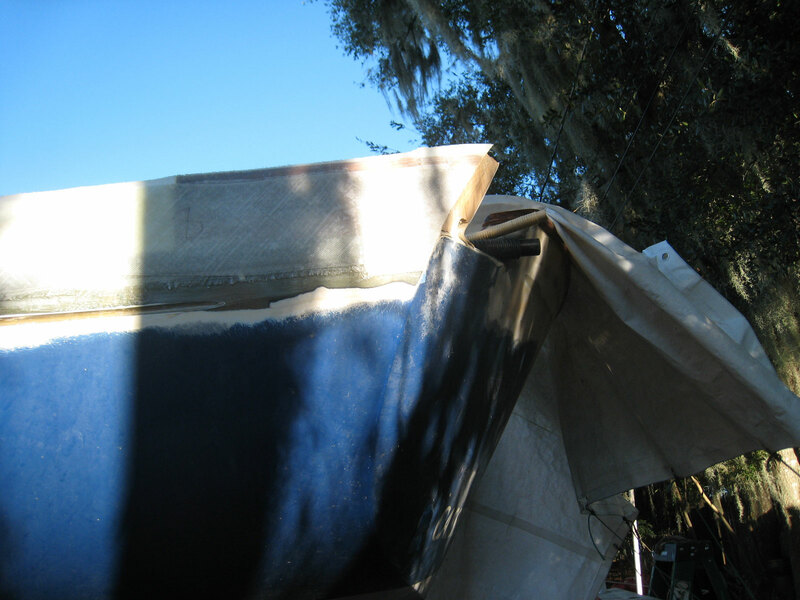 This weekend I applied two layers of 24 oz biax tape and 1 layer of 6 oz cloth to the inside of the bulwarks. I will apply the same lay up schedule to the outside next weekend. You can see some of the lay-up schedule for the port bulwark in the photo. More pictures to follow. 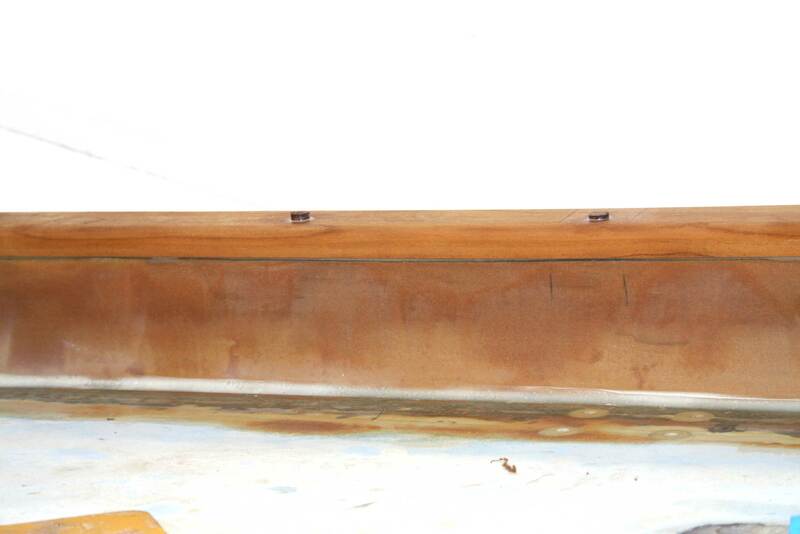 I painted the inside of the bulwark and about three inches onto the deck with epoxy using the extra slow hardener. The temp at this point was around 78 degrees. I thickened this mix with some 404 high density hardener but the mixture still remained runny. 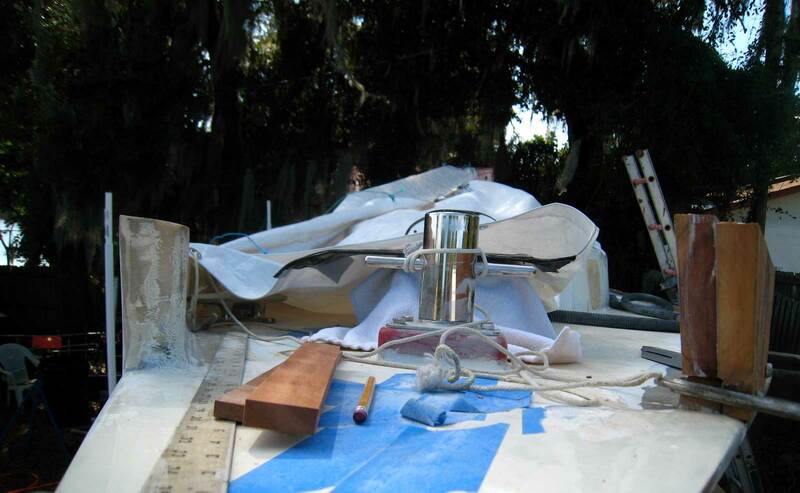 The thickener helps fill the small irregularities in the surface of the Styrofoam. I let the bulwark sit for about 20 minutes. I wet out the first layer of biax with unthickened epoxy mixed with the extra slow hardener. 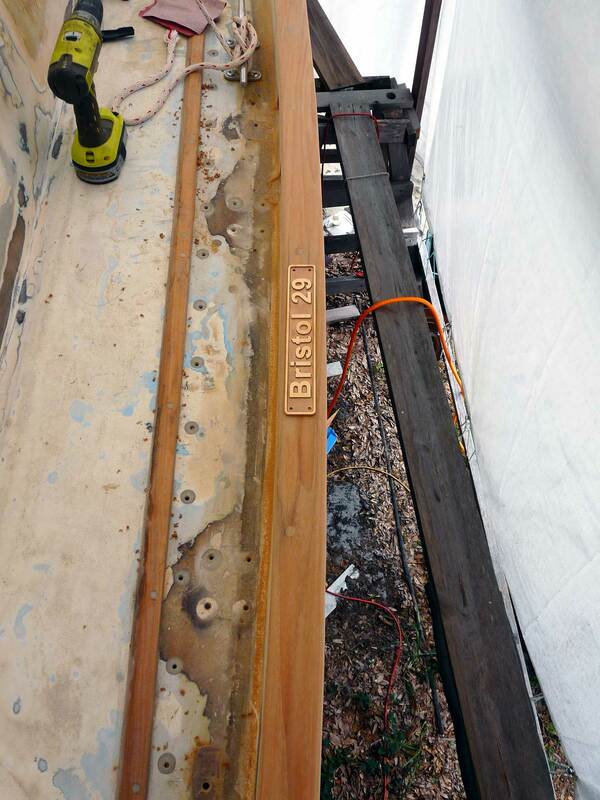 I laid on the biax strips, each about 6" wide and overlapped the side deck by about 3/4". 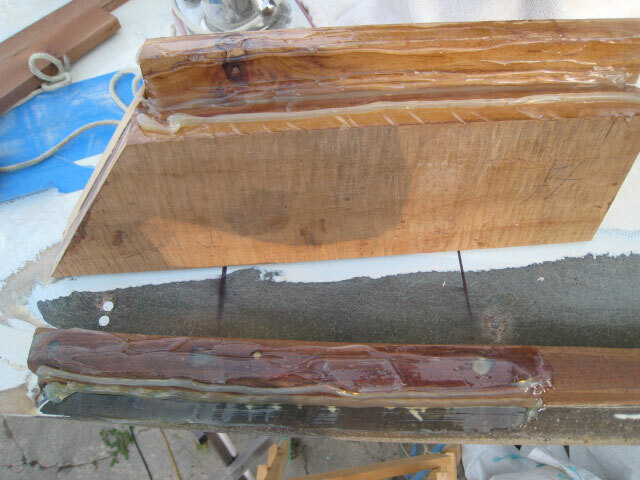 I wet out the second layer of biax with unthickened epoxy mixed with the slow hardener. 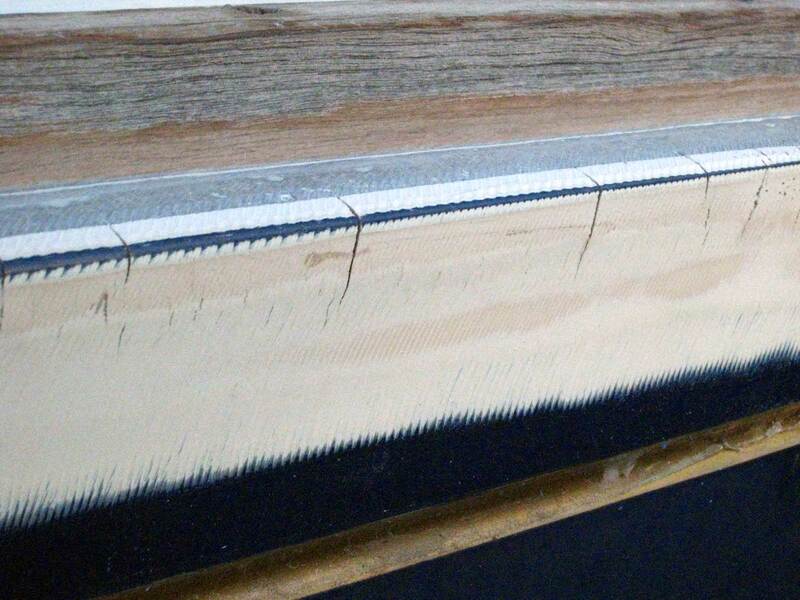 I laid these strips on, overlapping the side deck by about 1-1/4". 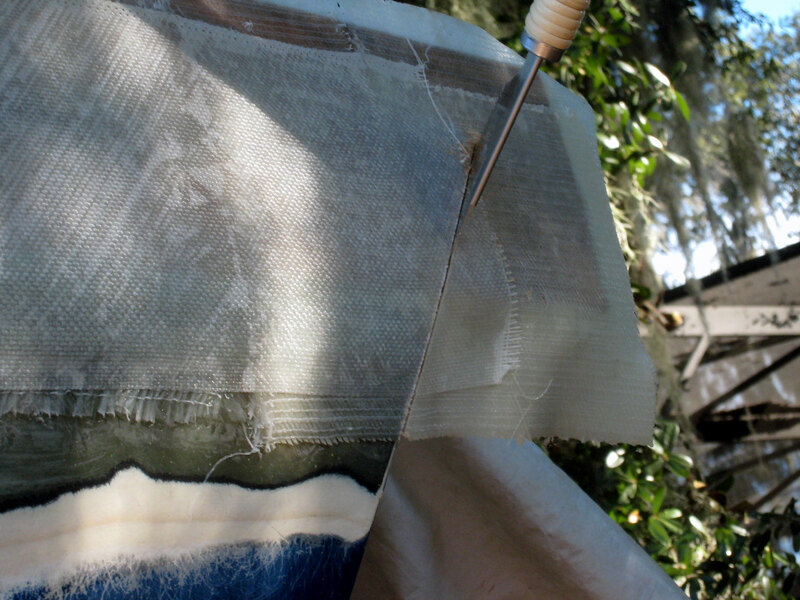 I wet out the third layer, of 6 oz cloth tape 8" wide) with unthickened epoxy mixed with the fast hardener. 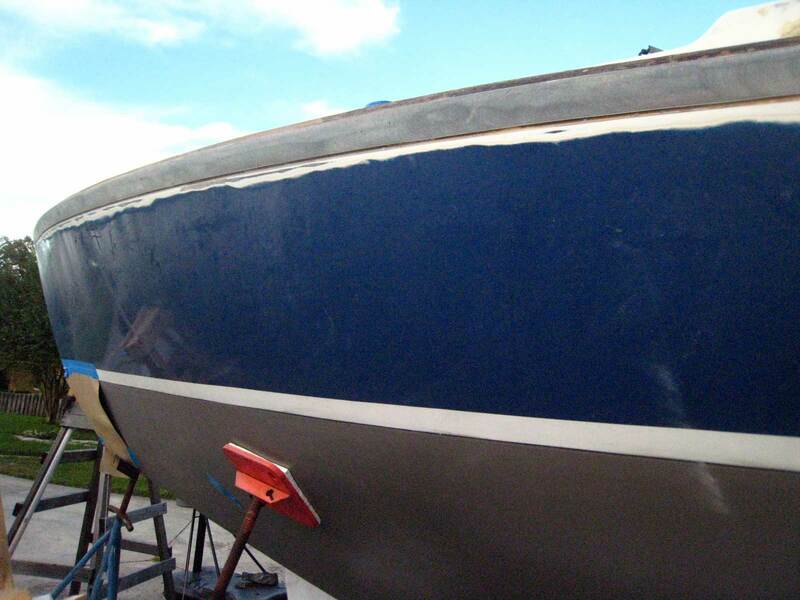 I laid the tape on to overlap the side deck by about 2". 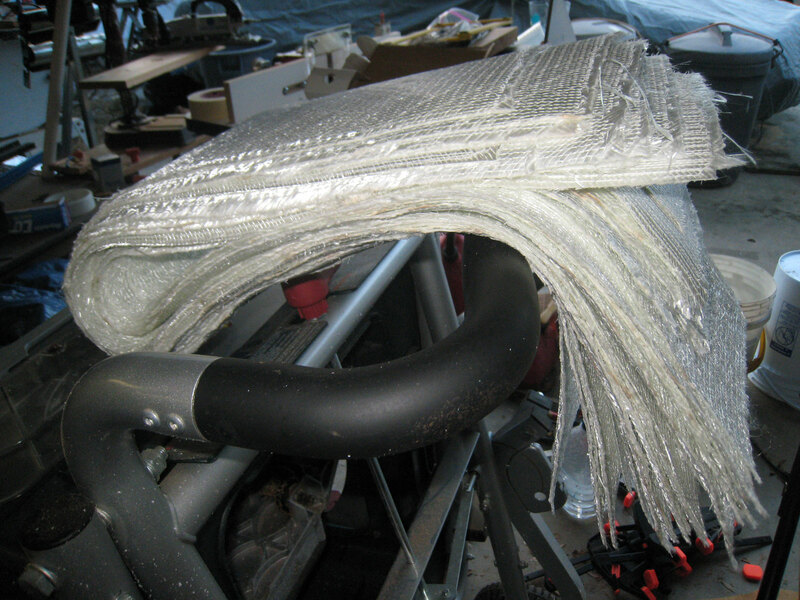 The purpose of the cloth is not so much structural as it is to provide a smoother surface than the biax with is very rough and requires a lot of fairing. Here is the inside of the bulwark glassed with two layers of 24 oz. biax and one layer of 6 oz cloth. The outside of the bulwark with the same layup schedule. Finally, I trimmed off the excess from the stern hawse pipe brace. 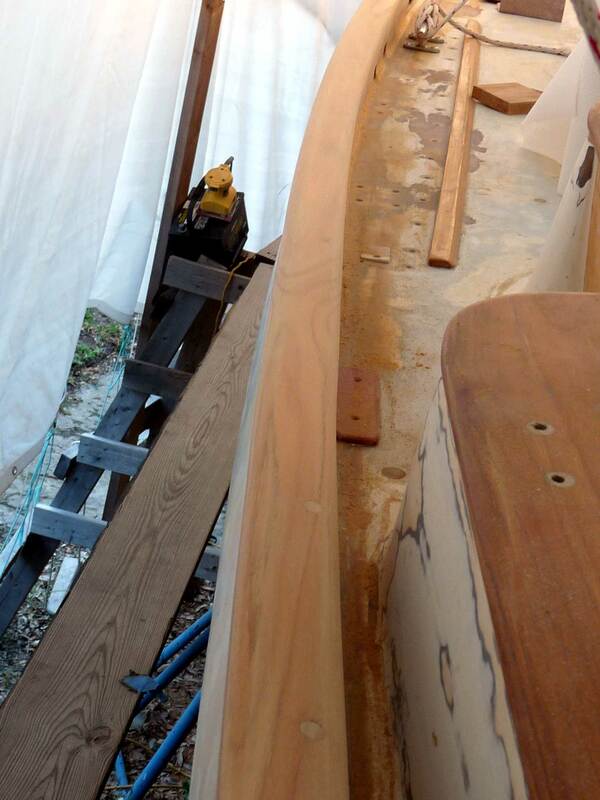 I used a Japanese saw and trimmed the brace to the shape of the stern. Here you can see how if follows the same shape. 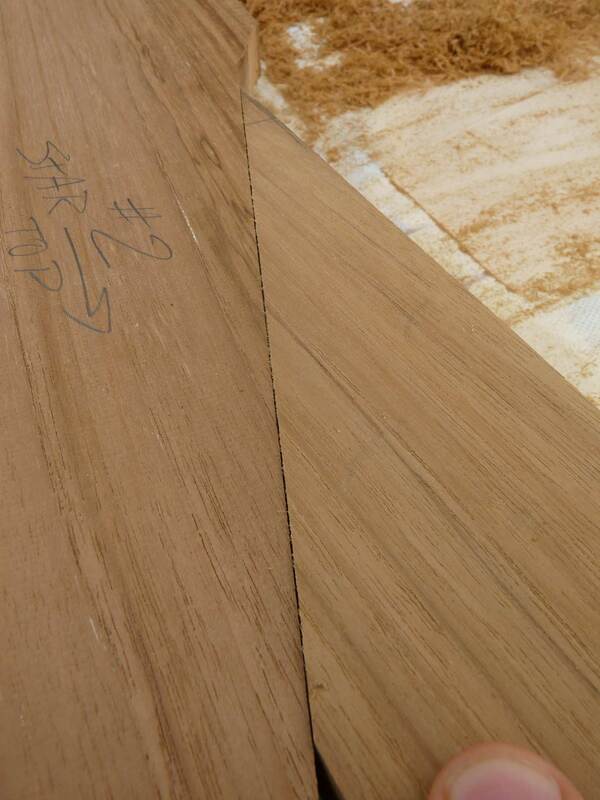 In this photo you can see the cross section of teak and glass. Here are some additional photos and commentary about building the bulwarks. 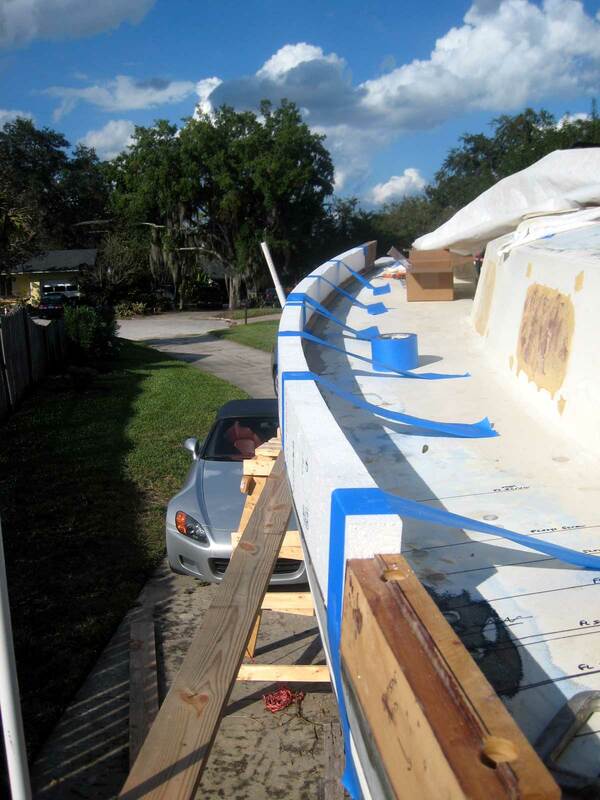 The specifics of the process are covered in the starboard bulwark webpage. 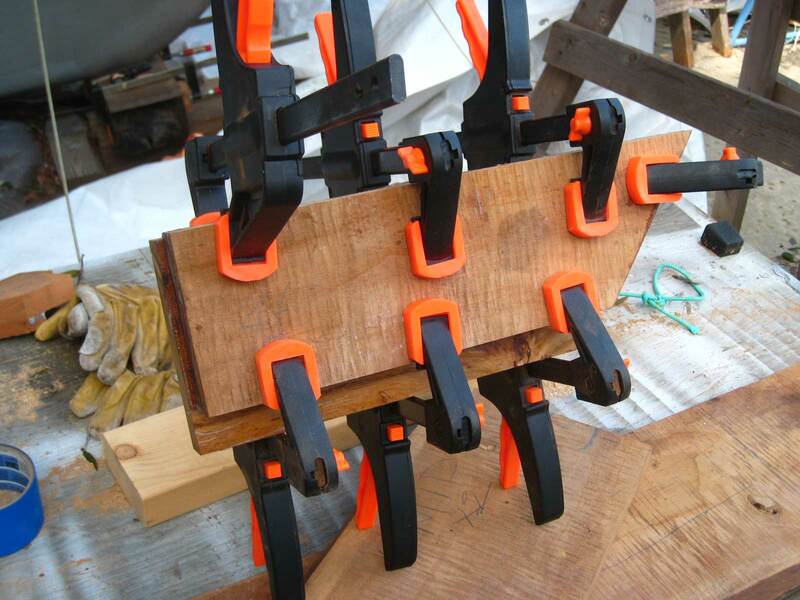 Clamped for position so I can compare it to the starboard hawse pipe brace. I'm just comparing the vertical angle of each side of the bulwarks here. I have pumped West System Six10 thickened epoxy onto both surfaces. 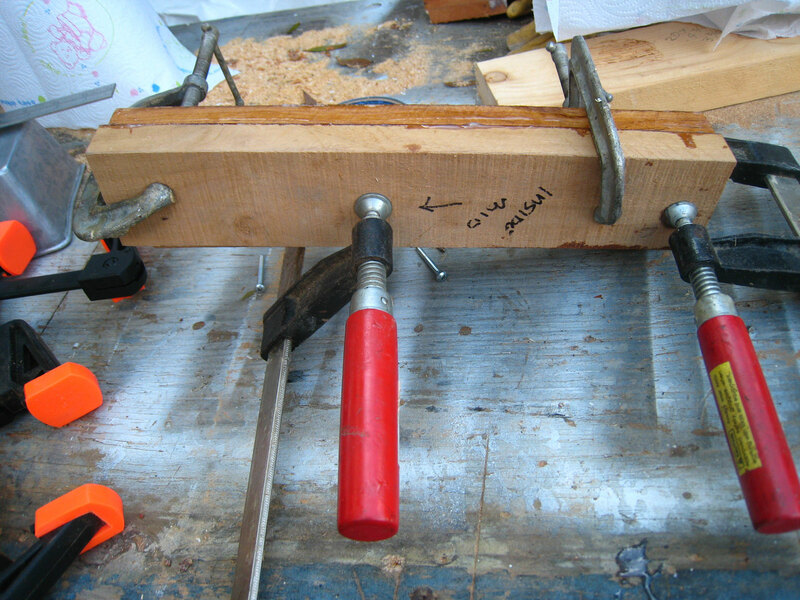 The bow hawse pipe brace glued and clamped. The photo shows the mounting holes drilled for the 5/16" 316 stainless carriage bolts I use to mount the bow hawse pipe brace. 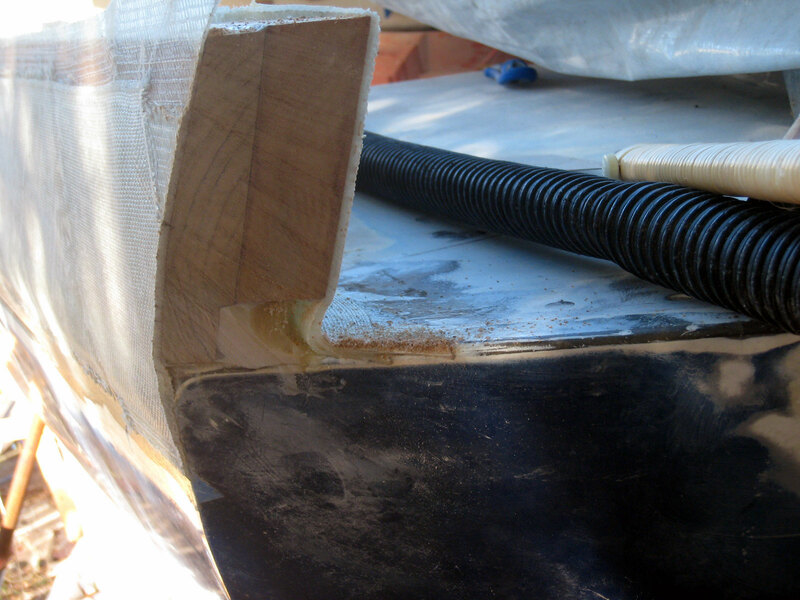 The thru-bolting is done only after the braces are glued in place, and all the fiberglass layup is complete. 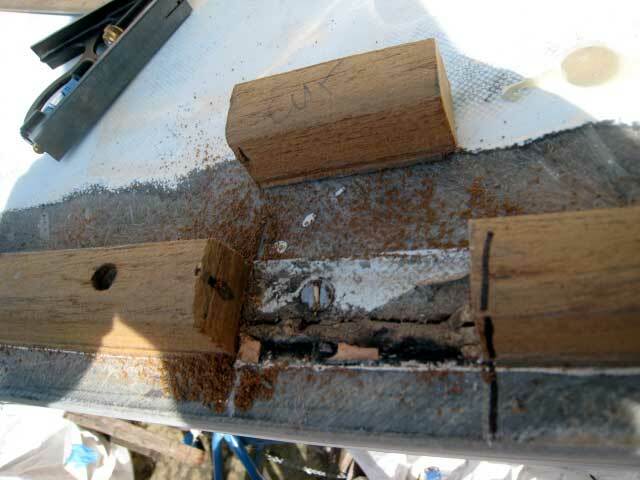 The holes are filled with thickened epoxy, the carriage bolts are pushed into this mess, the threads cleaned off down below, and the nuts are tightened thoroughly and Lok-tite is used for security. This shot just shows the fit and how everything lines up nicely relative to the toerail and hull to deck flange. 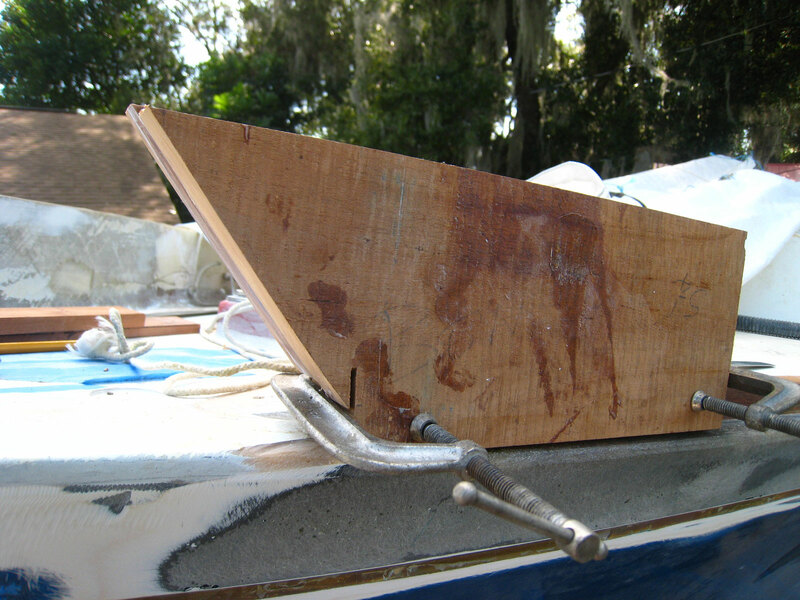 The holes are countersunk enough to account for trimming the bulwark to its final sheer height, and an inch below that line so that I can screw the teak caprail into the top of the brace without having to worry about hitting one of the carriage bolts. 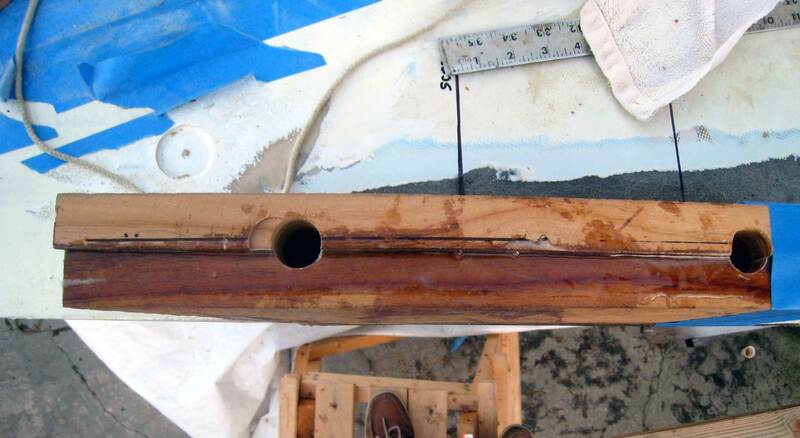 The amidships hawse pipe brace being glued up. 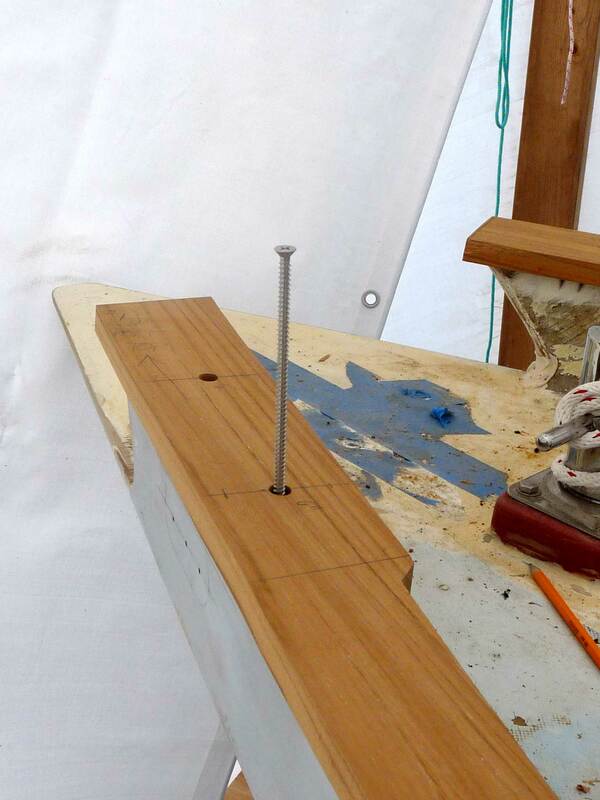 I made a point of marking where each of the toerail screws is and when locatable, where the hull to deck screws are. 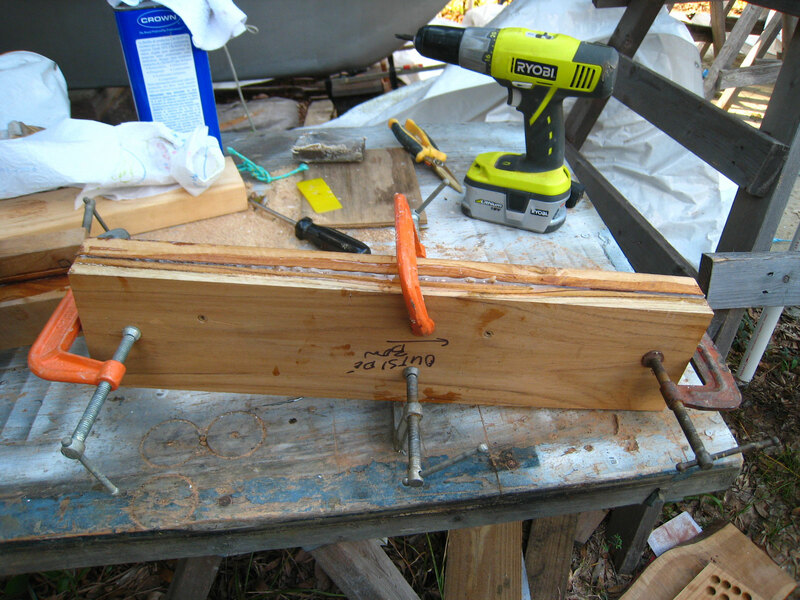 The amidships hawse pipe brace glued with Six10 and clamped. Mounting holes drilled for the amidships hawse pipe brace. The stern hawse pipe brace being built. 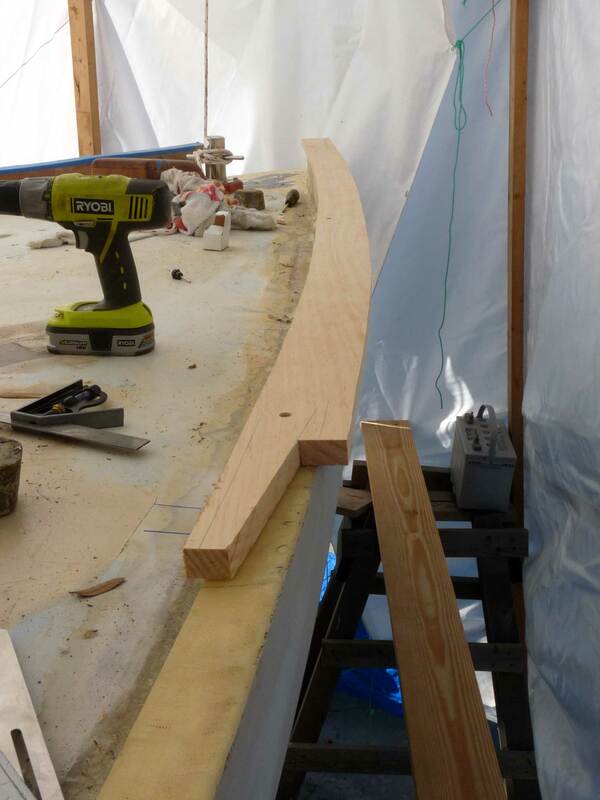 It has to be longer than the other two to accommodate the angle of the transom when it is trimmed. The stern hawse pipe brace glued with Six10 and clamped. 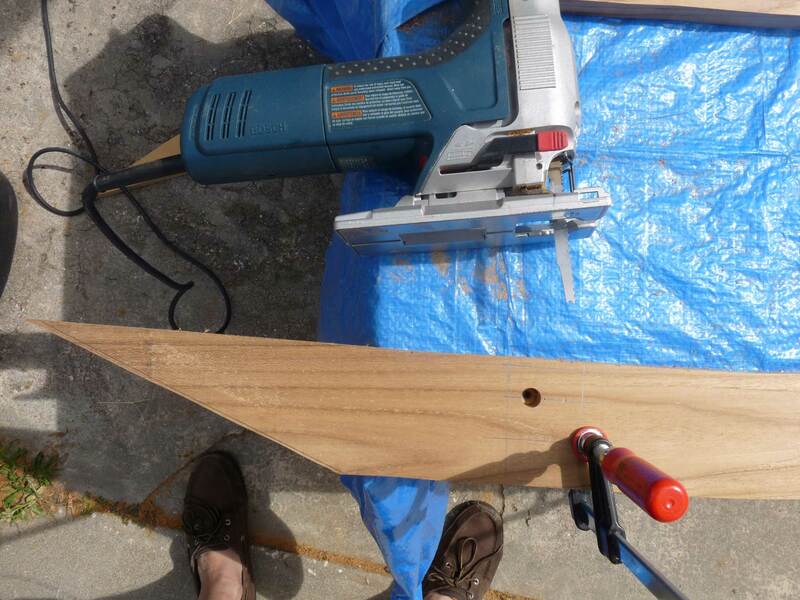 Mounting holes drilled for the stern hawse pipe brace. 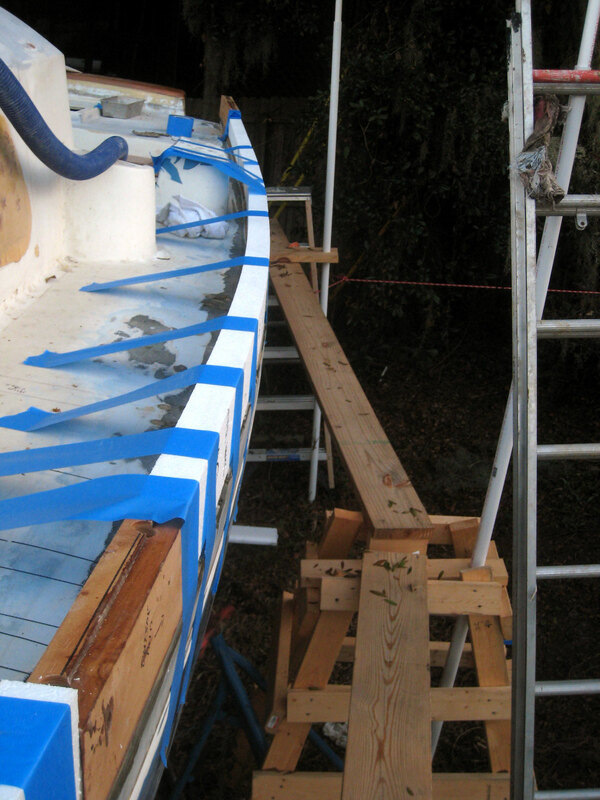 Here is how I position the 2" foam between the braces glue it with Six10 and hold it in position with blue tape. After the epoxy is hardened for the foam bulwark, I carefully shape the outside upper edge, relieving it just a bit to help give it a slight round. The foam shapes very easily using a palm sander and 80 grit sandpaper, but be careful to not take too much off. 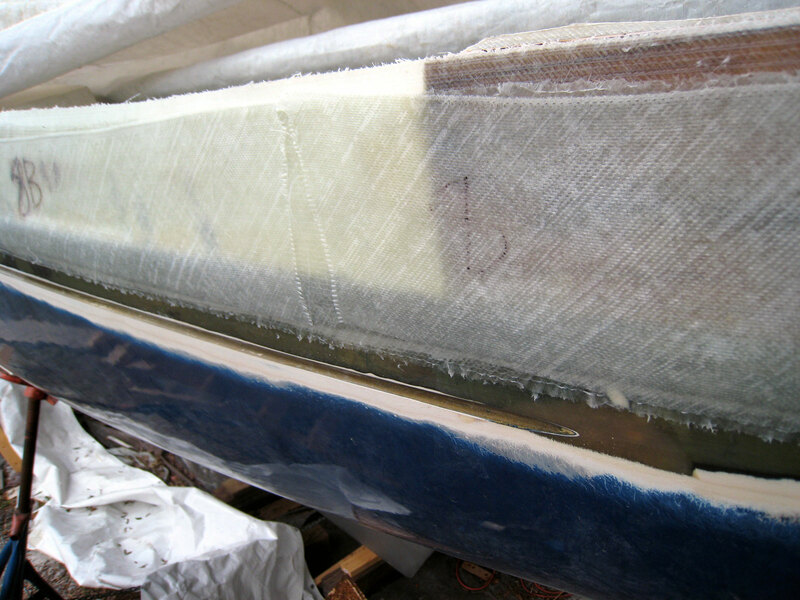 Then I faired the edge of the flange and down some onto the topsides to provide an even surface to fiberglass to. 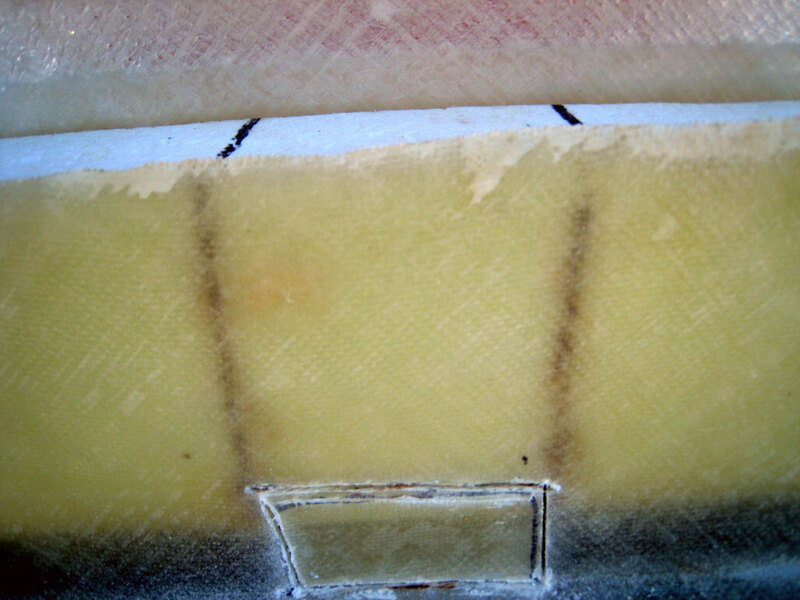 A shot of the inside of the bulwark with three layers of fiberglass in place. Again, disregard the top edge as about an inch or more of that will be removed with the final trimming to establish the sheer. 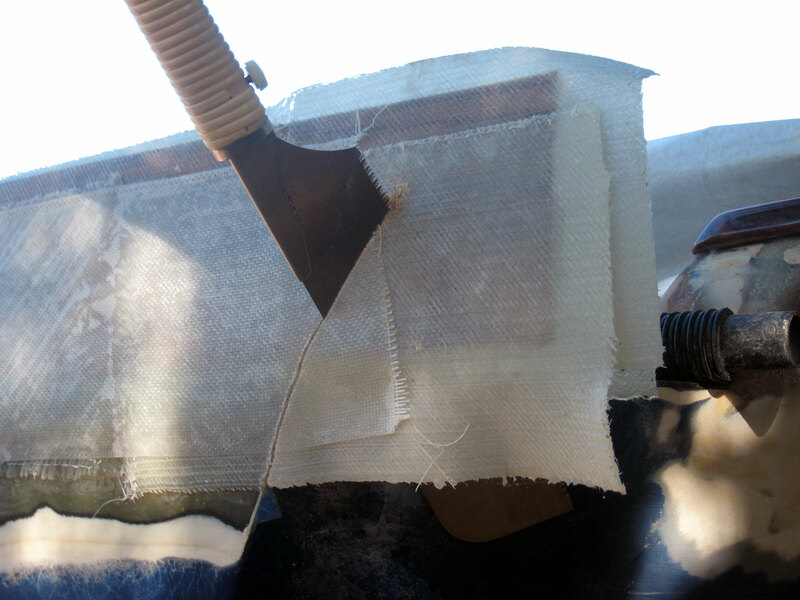 A shot of the outside of the bulwark with three layers of glass. 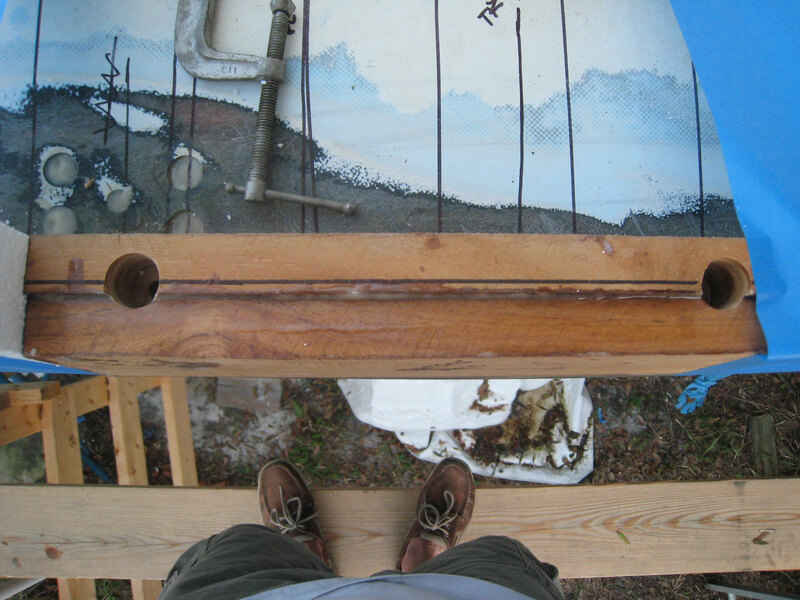 Using my Japanese saw to trim the aft stern hawse pipe brace even with the angles of the transom. 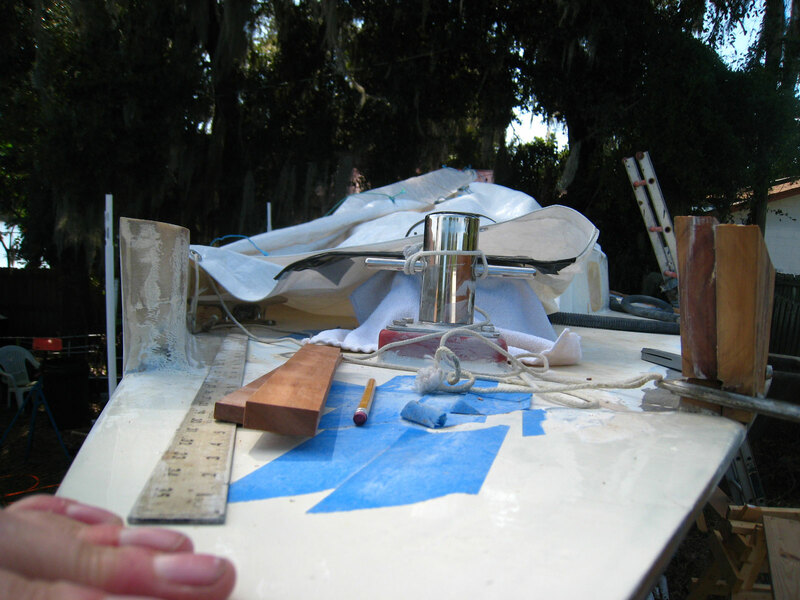 I used the fiberglass "C" section I bought from McMaster Carr and that I used on the starboard side. 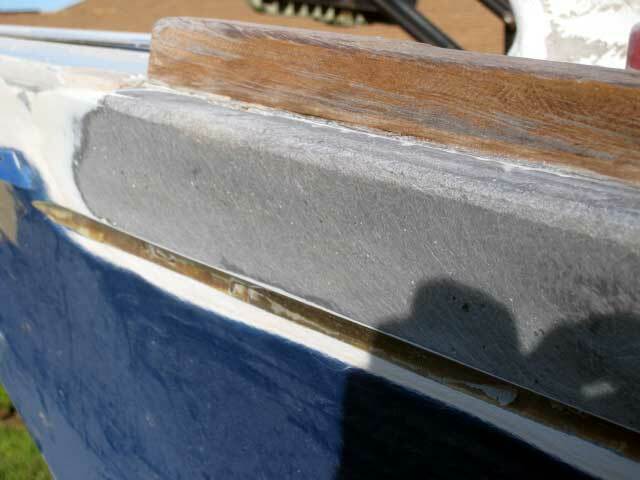 First I filled the inside corners with a thin fillet and let it set up in the sun. Later I will cut off 3" sections to fit thru the bulwark. Next, I cut the openings using my Fein Multimaster. I had marked on deck where I had cut openings in the toerail before installing the bulwark. The Fein made short, easy and controllable work of it. I cut the "C" section into 3" lengths and installed each--they were proud on each side of the bulwark--and carefully taped around the opening. 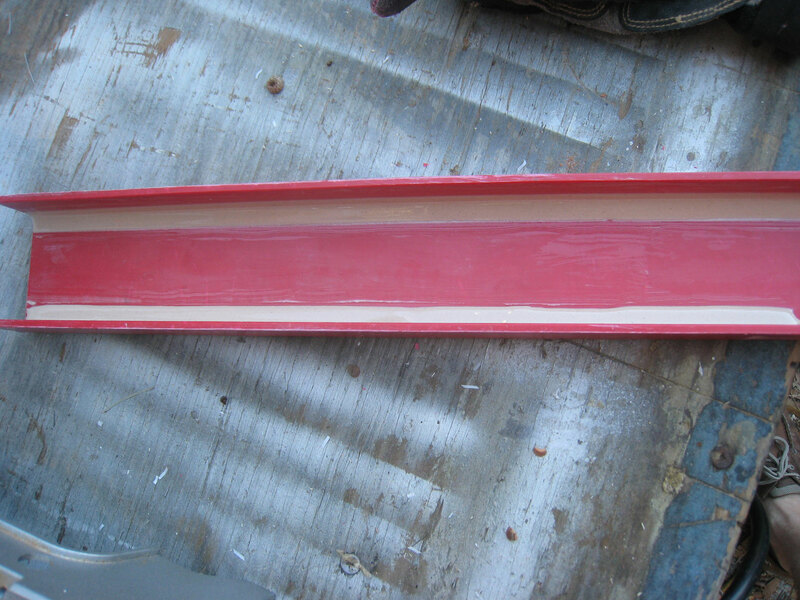 I drilled a hole down thru the top of the Styrofoam and slowly poured thickened epoxy with 404 high density filler. I used a extra slow hardener because the epoxy will exotherm in such an enclosed space and melt the foam. The extra slow hardener gave me plenty of pot time and did not heat up as it hardened. 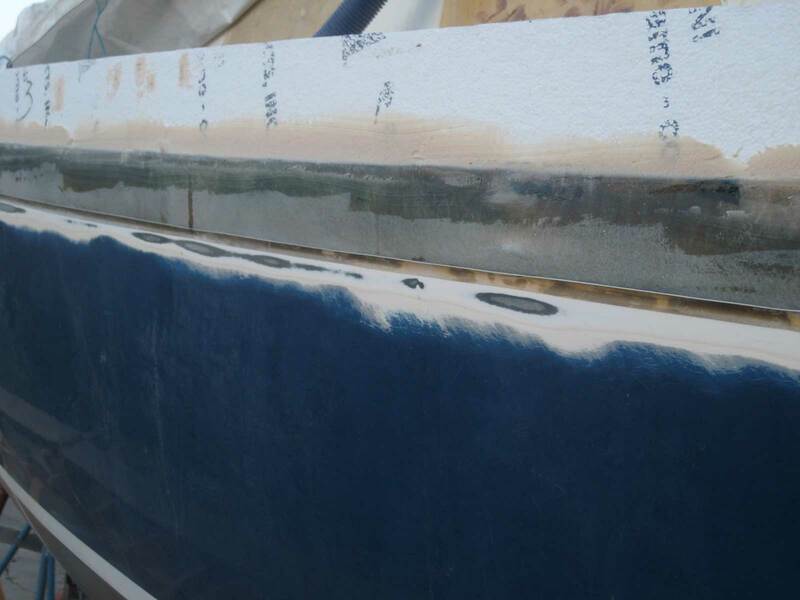 Here is the outside of the scuppers embedded in thickened epoxy (sorry for the camera shake). It will be sanded fair to the side of the bulwark. 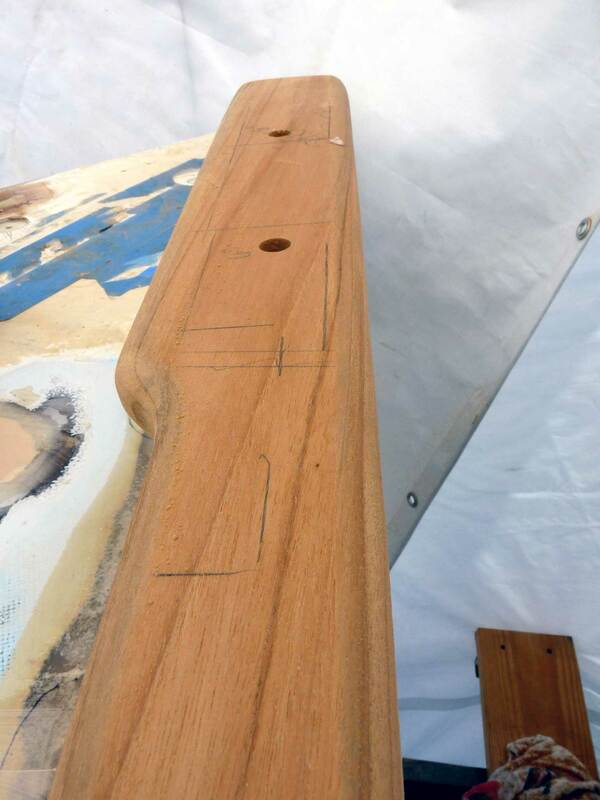 The caprail will be from the matching teak plantation stock used for the caprail on the stern bulwark and for the cockpit coamings and covering boards. 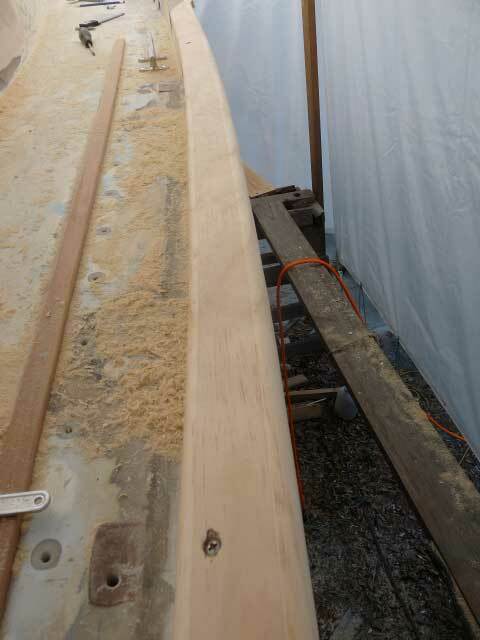 It is 7/8" thick and the boards for the caprail are 9' long and 7-1/2" wide. Before breaking out the teak boards I decided to "practice" using some relatively inexpensive milled pine from Lowes--boards 3/4" thick, 8' long and 7" wide. 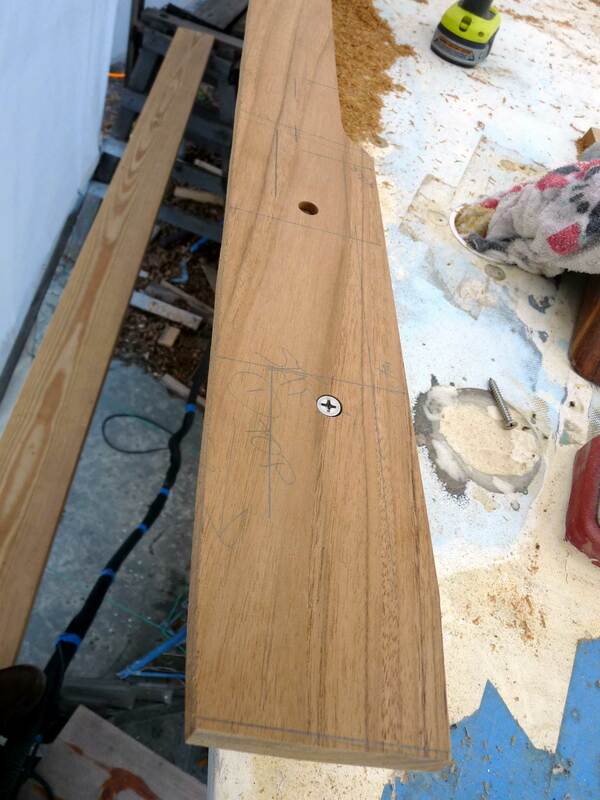 I positioned the first board at the starboard bow, pinned it with some temporary screws and scribed the curve of the bulwark, giving myself an inch margin outside and about 3/8" inside. Then I rough cut the curve on the band saw and installed. I used a template to mark the one side of the scarf join, removed the board, cut the scarf with a hand saw and reinstalled the board. I followed the same procedure for the second board. 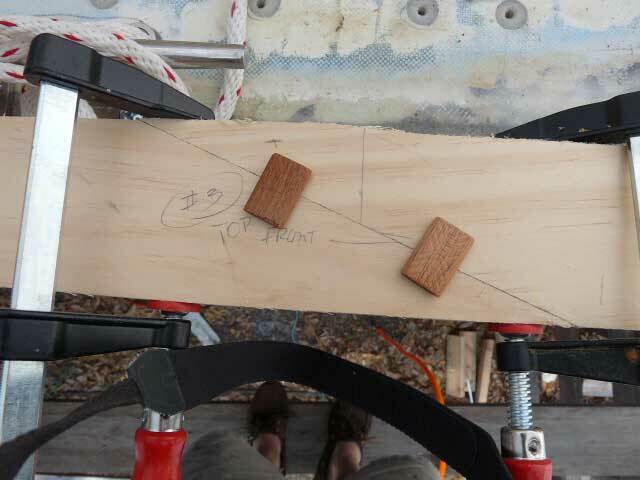 I overlaid the forward end of the second board on top of the scarf joint and traced it onto the underside, then again cut the matching scarf with a hand saw. Then attaching temporarily to the bulwark. As you can see, the scarf is unsatisfactory--mostly attributable to my lack of skill with a handsaw. The next scarf I will cut using my Bosch jig saw and straight-edge guides. For the next board I added, I used a simpler diagonal cut scarf, cut with a straight edge and my router. 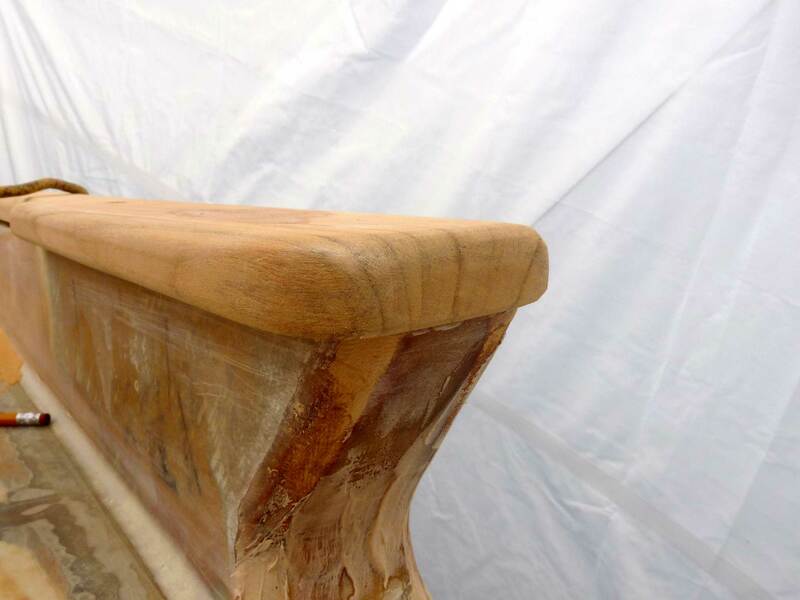 Since the boards are not bent to the shape of the bulwarks, but the shape is sawed, there should be no tension on the scarfs. I will add two dominos to strengthen the joint. Finally I did some experimental shaping to the third board: the results of which helped me to decide the caprails' final width (complicated by the fact that the port bulwark is 1/8" wider than the starboard bulwark) In order to not cut the port bulwark wider which would obviously point out this difference, I plan to cut the outboard overlap of the port side 1/8" less than the starboard side (5/8 to port and 3/4 to starboard). 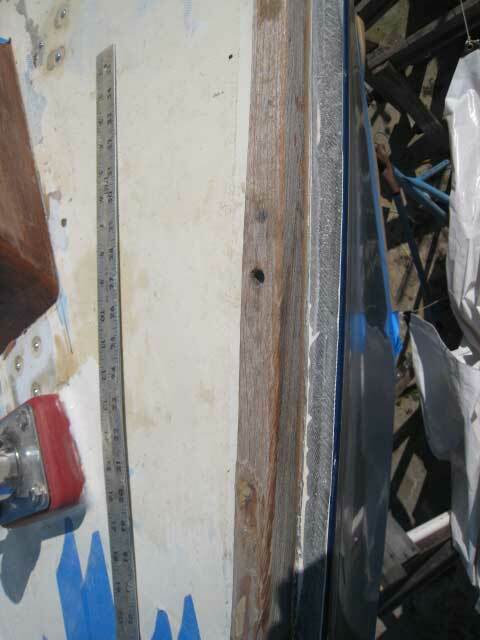 That will ensure that two caprails are the same width, and the overlap would really not be comparable with the boat in the water. The inside edge of the caprails will be cut 1/8" proud of the flush inside, rounded at the top with a 3/8" round over bit. 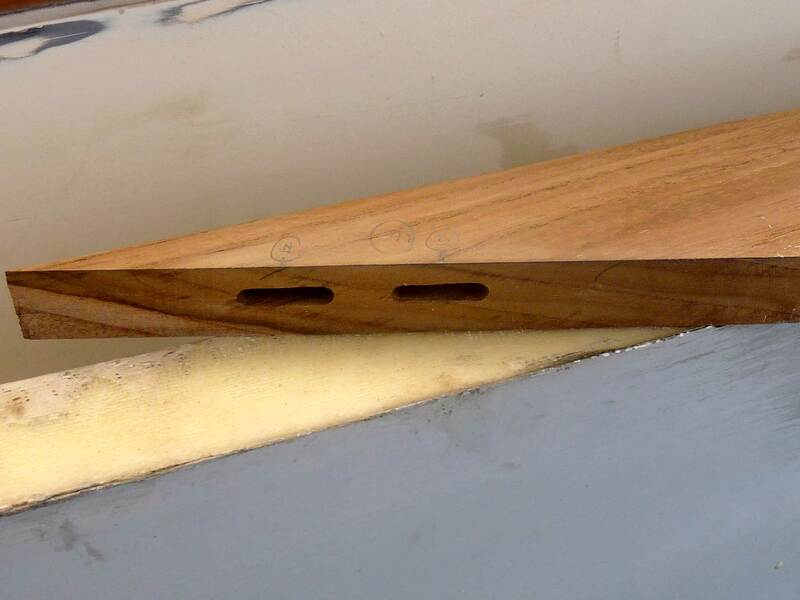 The outboard edge will be rounded on the top with a 1/2" round-over bit and underneath with a 1/4" bit. 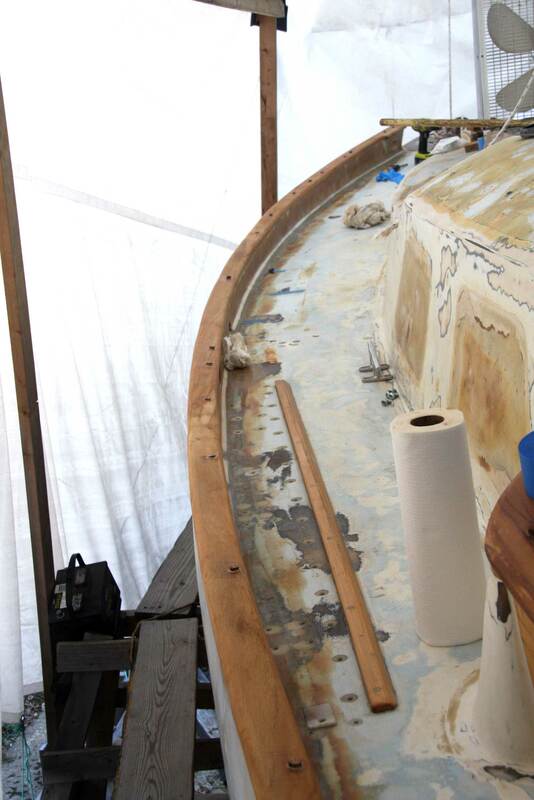 The round-over's for the captail are the same as the round-over's for the covering boards in the cockpit. The caprails are attached by gluing them to the tops of the bulwarks in thickened epoxy. 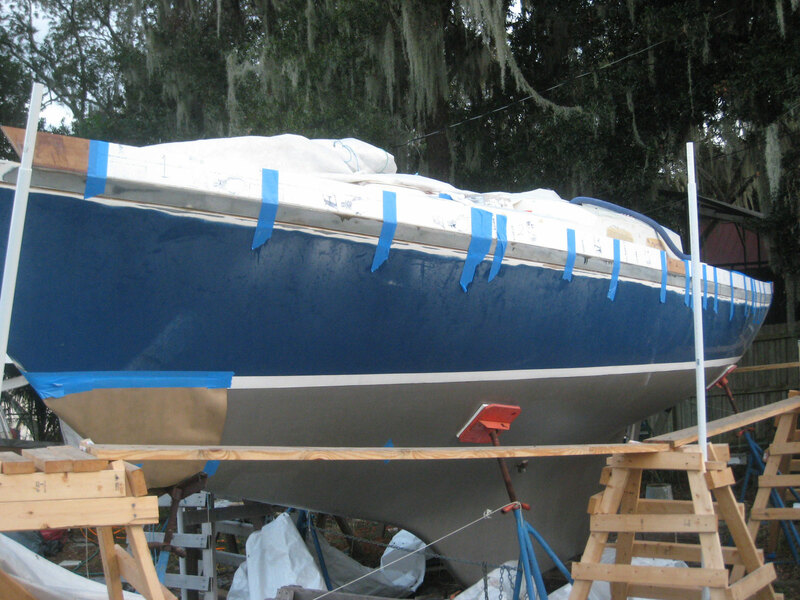 The bulwark stops are three layers of 6 oz fiberglass expoxied in place tying together the sides to the tops of the foam and teak braces. 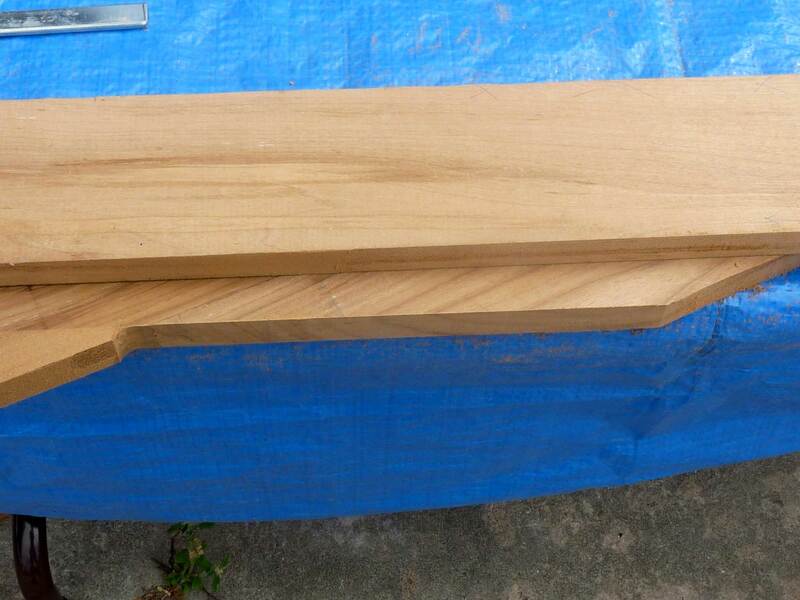 Then the caprails are screwed down on 24” centers to the teak braces. 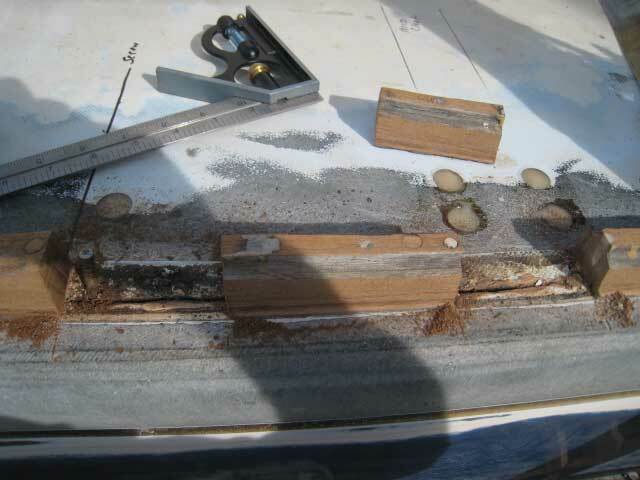 I will use #14 screws long enough to screw into the hull to deck flange. Lay the first board over the bulwark, temporarily secure and scribe the inside and outside edges. Cut the caprail and attach with screws. 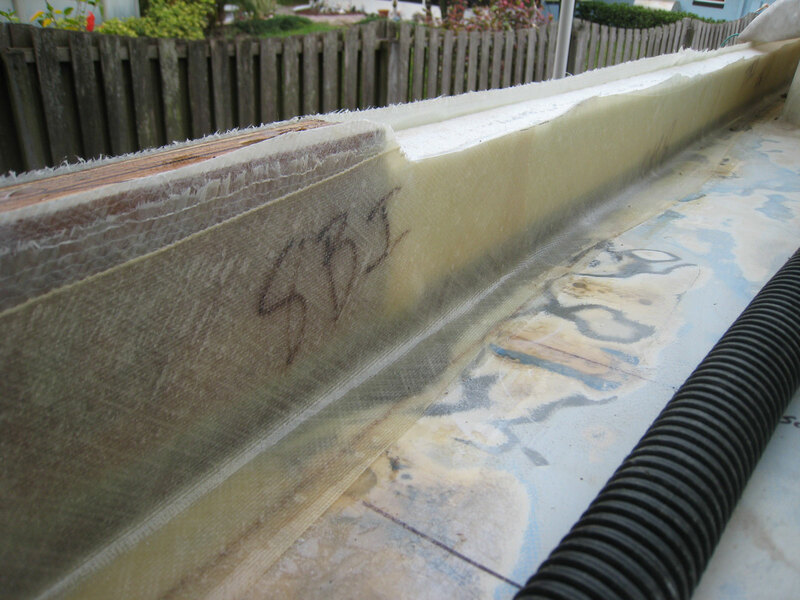 Scribe the joint bevel on the aft end of the caprail. Rough cut the bevel 1/8” proud of the line. 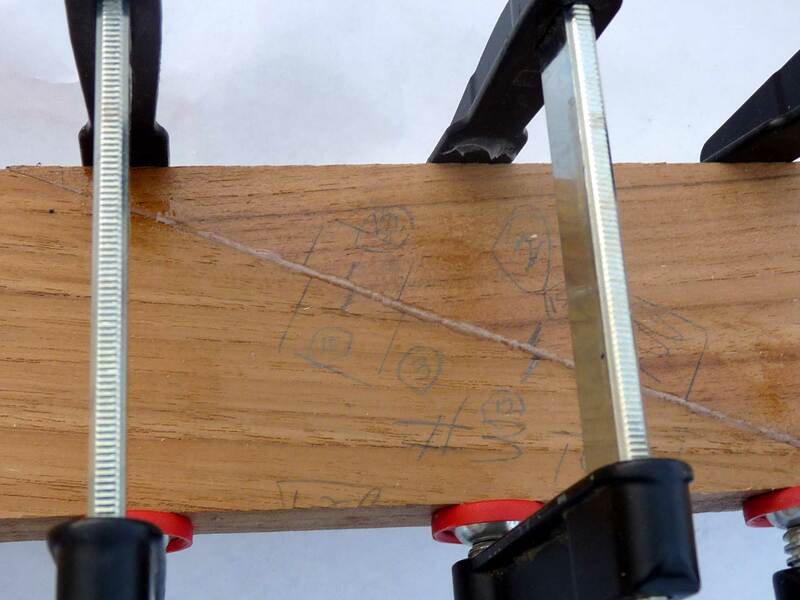 Cut to the line using a flush cut router bit. Re-attach the board, overlay the forward end of the second board, and scribe the underside of the second board with the bevel. 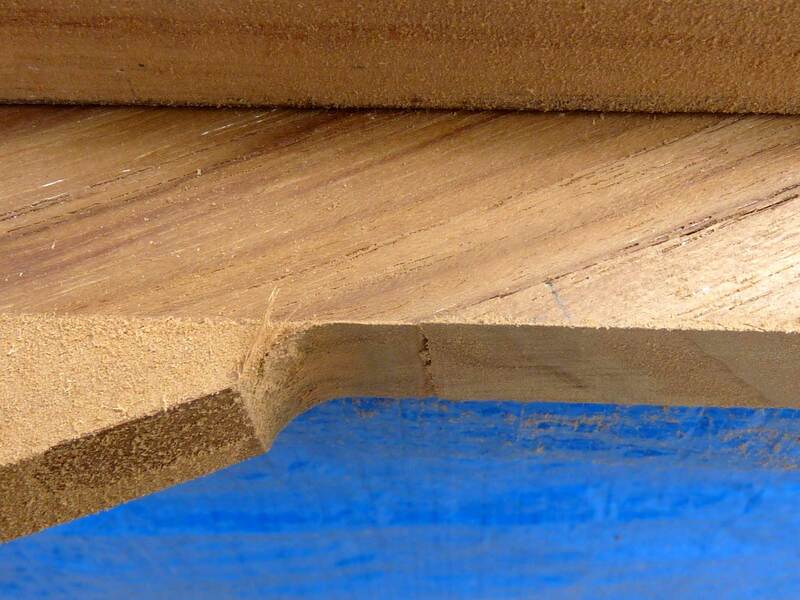 Rough cut the bevel 1/8” proud and cut to the line using a flush cut router bit. 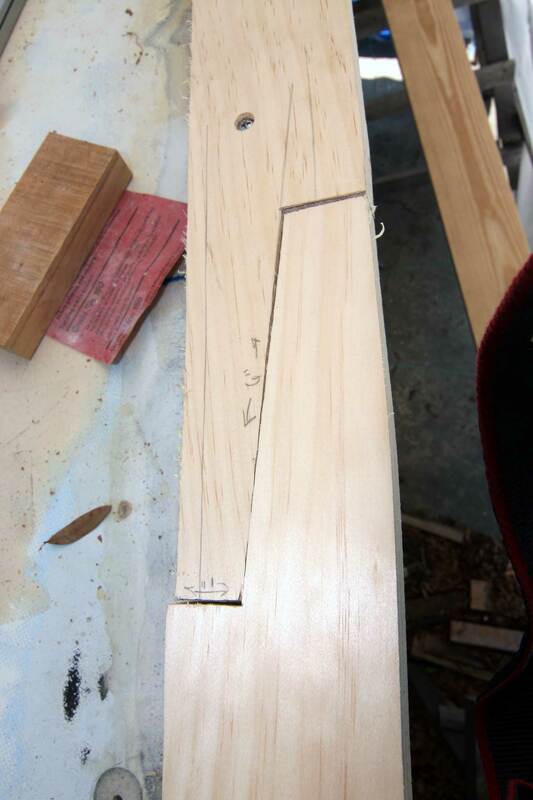 Re-position the second board so the scarf joint is tight, and scribe the inside and outside edges. 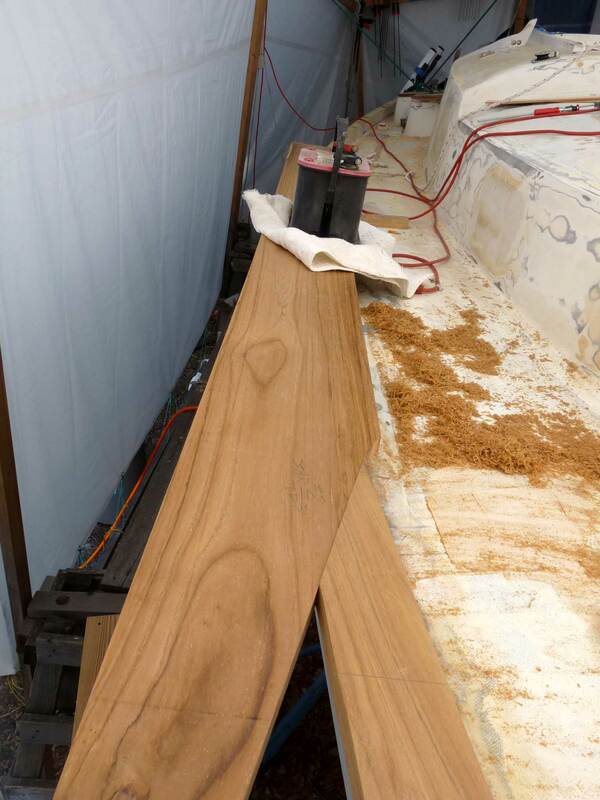 Here is the first of the starboard teak boards rough cut to fit the curve of the bulwark. For the forward section of the caprail--the first 14 inches I increased the width by 3/4" on the inside, just as an aesthetic feature. 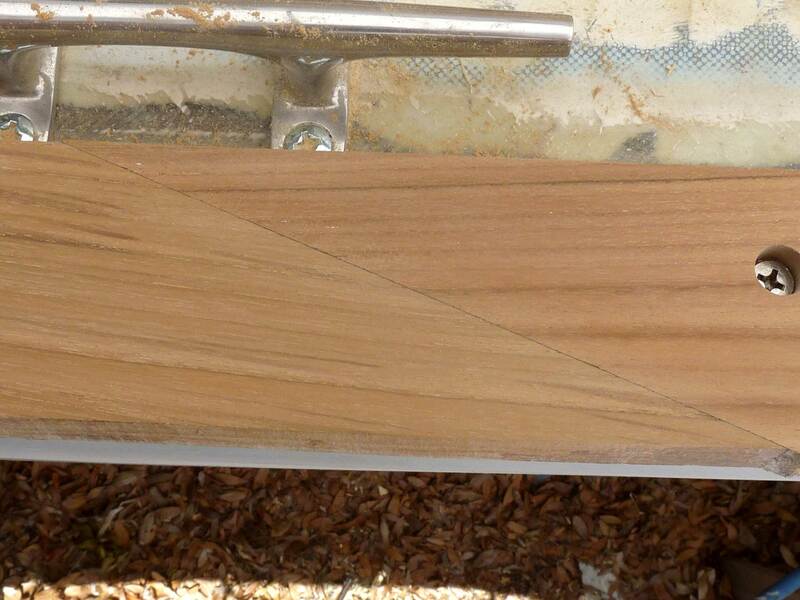 The inside edge for the remainder will be flush cut. I then cut the end in a bevel that I will duplicate for the adjoining board. 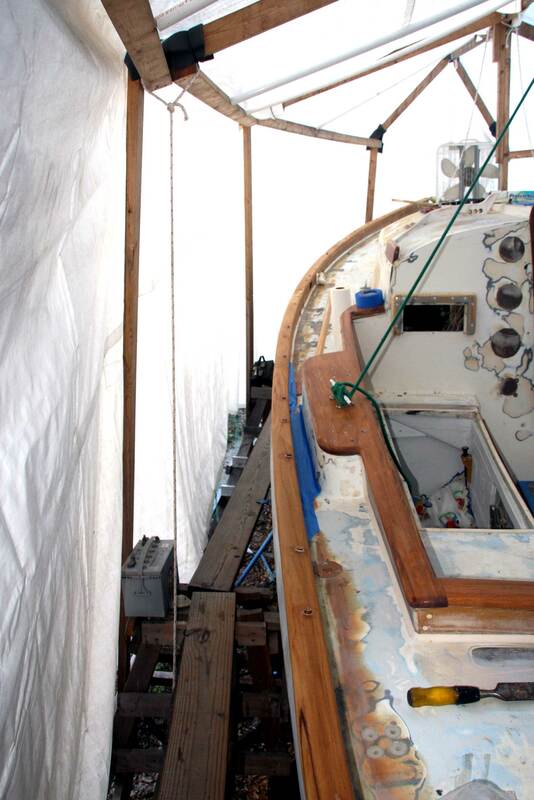 Here you can see I am beginning to fit the second section on the starboard side. I laid the second board on top of the first and scribed the bevel on the underside. I cut the bevel (more about how I did this in a moment) and then refitted it in place (good use of old battery). I then scribed the inside and outside edges. Here is a close up of the joint. Preparing to saw the caprail section. Here, I have rough cut the diagonal for the scarf with my jig saw, leaving about an 1/8" proud. I am about to trip the diagonal with my flush bit on the router. 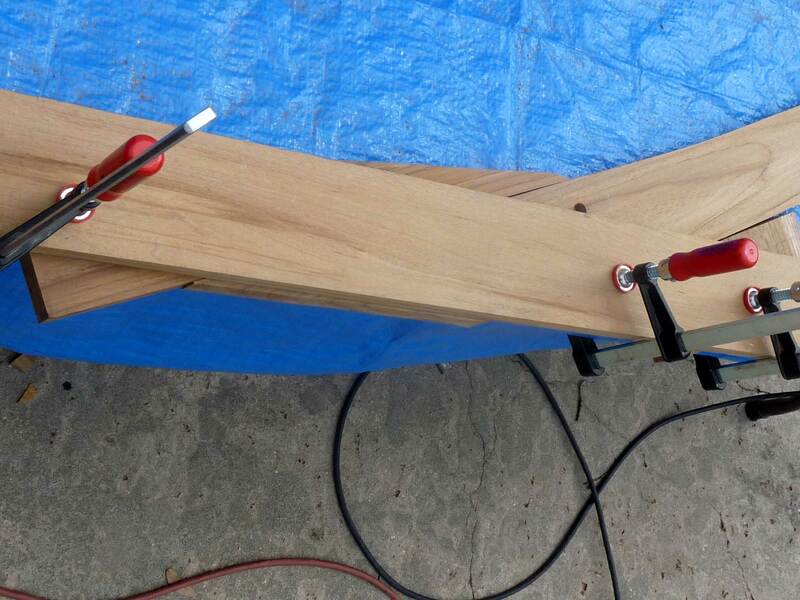 I have laid a known, true straight edge over the caprail board and clamped it in place. To keep the end from breaking out, I butted a scrap piece of teak against the edge and continued the trim cut into the scrap. Here is the finished cut from the router. Screwing the caprail pieces in place as I go. The same scarf after a bit of light sanding. The scarfs were all glued with the caprails not screwed in place so as not to stress the joints while the epoxy cured. After two days of hot weather I screwed the caprail back in place in preparation for final routing. 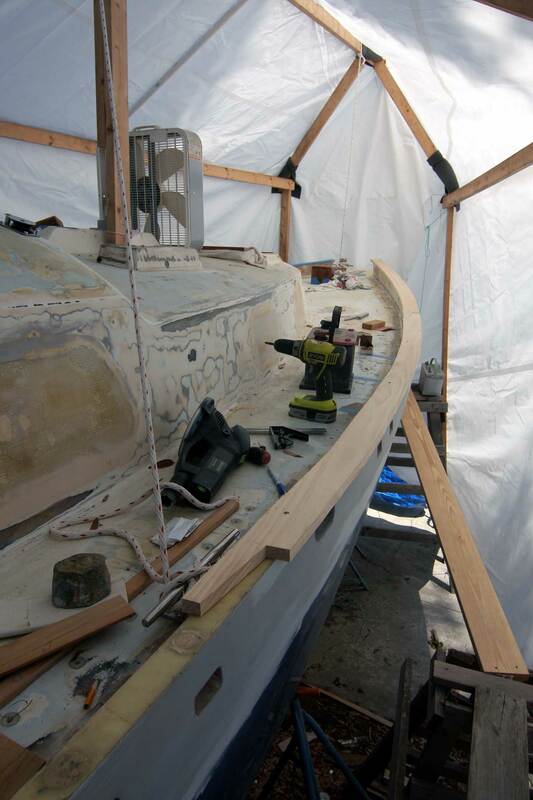 Here, I am almost finished with rough cutting and fitting the port caprail. This is a 6" long #14 self tapping screw that will attach the caprail to the bulwarks. 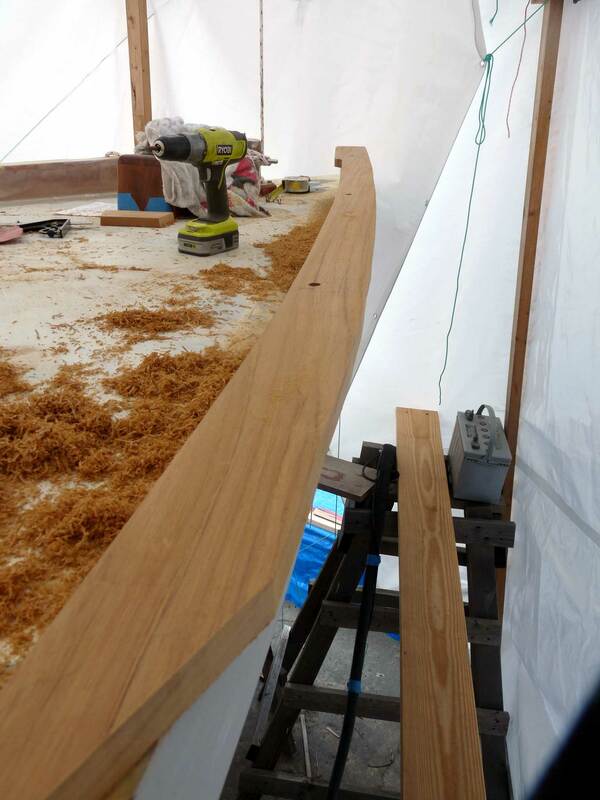 I am using lengths of screws to pass all the way down through the bulwark and through the hull to deck joint, to tie everything very strongly together. So at the bow where the bulwark is 5" tall I use a 6" screw, etc. Final machining and sanding; ready for gluing. The port caprail glued and screwed. 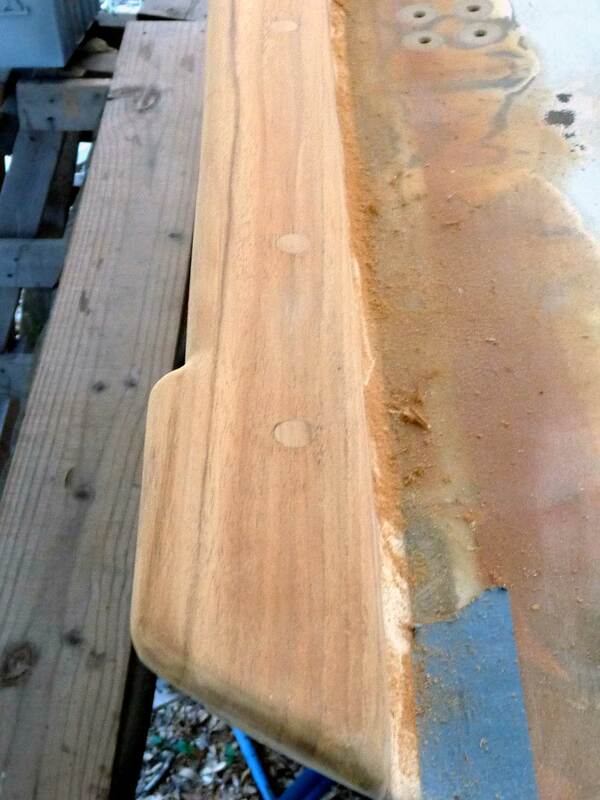 It too about an hour to mix and spread the batches of epoxy before positioning the caprail. The temp inside the enclosure was marginal, around 88 degrees and even using the slowest setting hardener it almost overtook my efforts. The caprail is screwed with screws long enough to reach through the bulwark and through the fiberglass flange, adding additional strength to the bulwark and tying everything together. The caprail gives me almost another inch of height to the bulwarks. The bungs were trimmed with a zero kerf Japanese saw and lightly sanded. 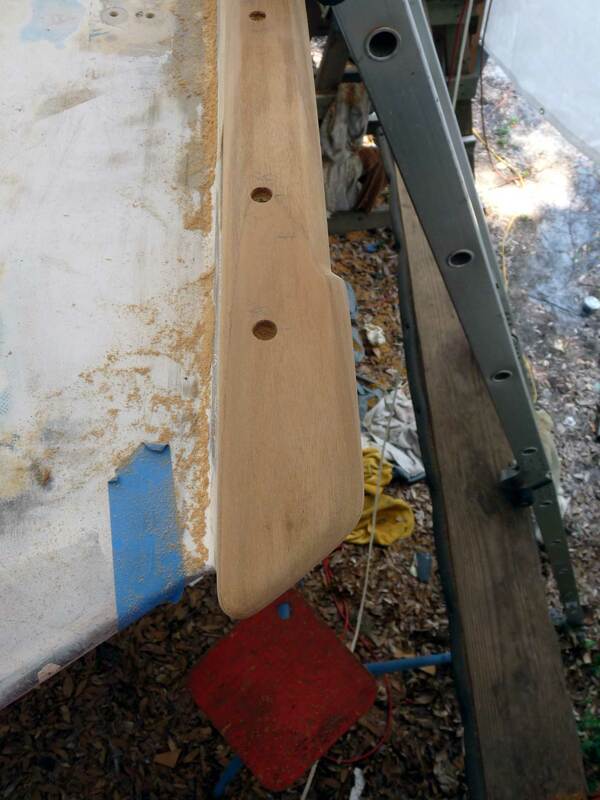 Finished up bunging and sanding the caprails today. 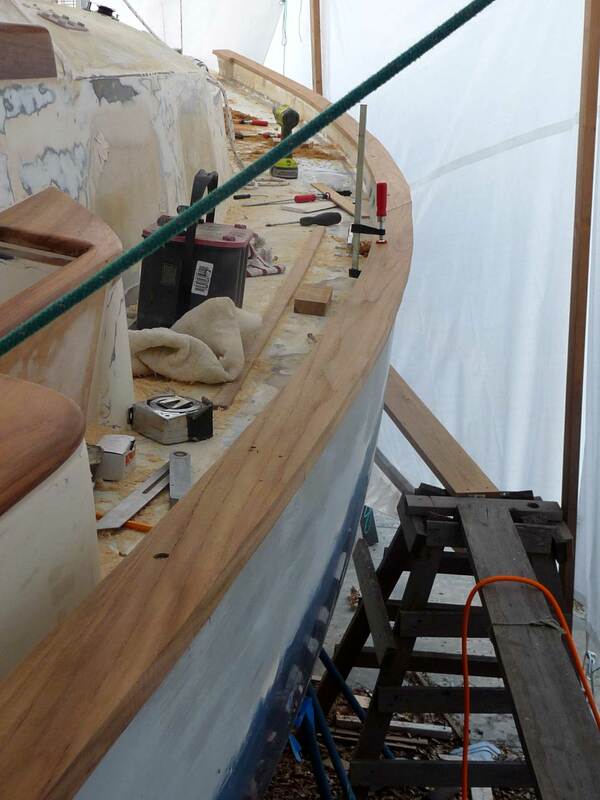 Here is the starboard boarding step in position. The caprail and the boarding step. 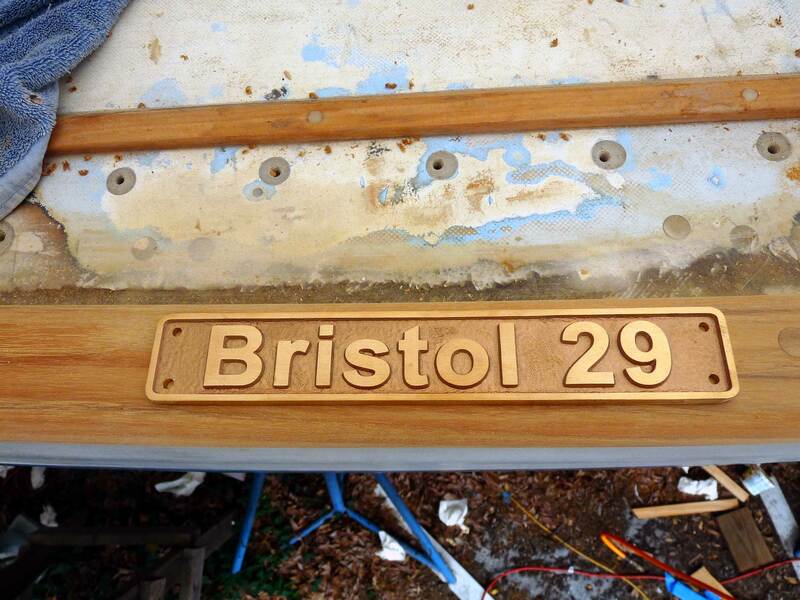 All ready for the first coat of epoxy.